They might not be a chance to add the latest and greatest to your collection, but any time Colbey at Cardboard Collections runs one of his affordable group breaks, you know they're an opportunity to take a walk down memory lane for just a few dollars. In late January, he decided to order up some 1995 Pinnacle products, and I bought the usual two-team slot. As usual, part one includes the Rockies, who are on a three-game winning streak, and the randomizer decreed this time that part two will consist of Philadelphia Phillies. Pinnacle Brands put out quite a few products in 1995, including the penultimate year of the lenticular Sportflix set. This set has quite a bit going on. Not only are there two photos of third baseman Charlie Hayes to be found when you tilt the card, but also his last name appears to rush out at you on the right side. 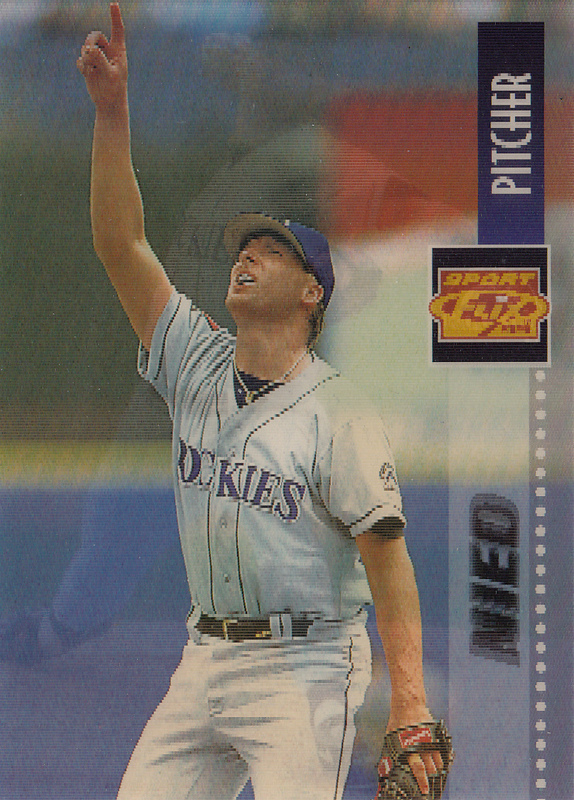 Even more than that, the logo on the right side alternates between the Sportflix '95 logo and the Rockies team logo. These never come across that well in scans, but I don't really expect them to. 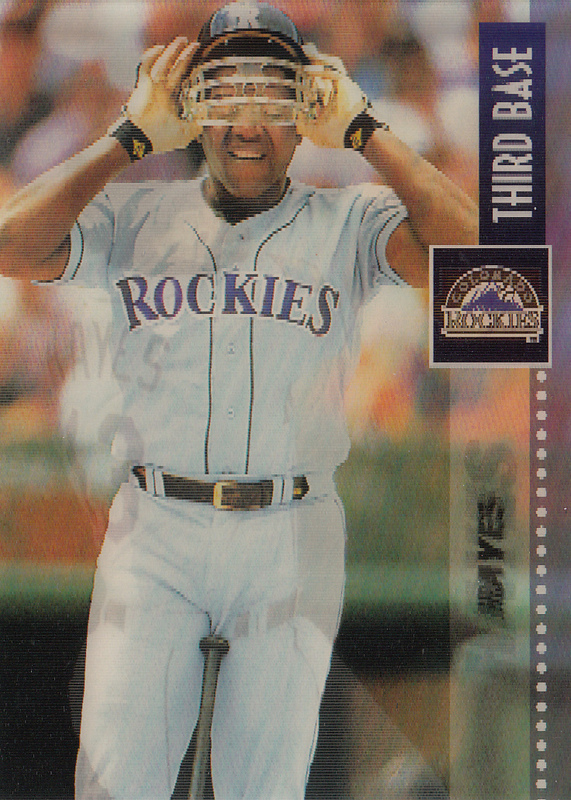 What you can see anyway is Charlie Hayes' special face guard, which was such a curiosity that it appeared all over his 1995 cards. It pre-dated the C-flap by over twenty years. There aren't too many stats on the back, but Pinnacle did highlight a few career totals in the Triple Crown categories. Seeing a .267 average isn't too jarring, but above that are his 367 career RBIs, an oddly huge and in-progress number that isn't usually featured on a card, which tend to focus on single-season accomplishments. He finished his career in 2001 with 740 RBIs and a surprisingly consistent .262 average. So many pitcher cards show them mid-delivery, with their elbows, arms, and faces contorted into frightful positions. 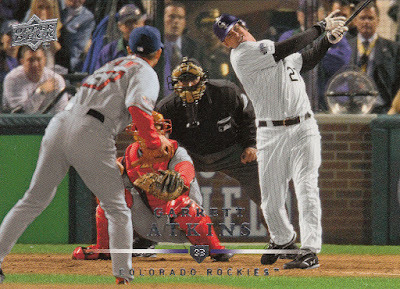 The ghostly half of this lenticular card is no different, but the alternate image shows a rarely-seen shot of this Rockies ace calling a popup. Pitchers seem to do this less often these days, but it's still surprisingly rare to see on a baseball card of any era. On the back, Pinnacle kept the same theme of including full career statistics through 1995. There's also a small mention of Nied's "first full Major League season" in 1994, blatantly disregarding the strike that shortened both the '94 and '95 seasons. The career stats selected for these card backs mirror the Pitching Triple Crown, the lesser-known cousin of position player greatness. Those stats are wins, strikeouts, and ERA. It's a bit more common for pitchers to lead all three categories than batters to hit for average and power, but it's still quite rare. It hasn't been done since 2011, when both Justin Verlander and Clayton Kershaw pulled it off. Anyway, looking at the back of Nied's card shows what would pass for a fairly decent single-season performance: a 17-6 record, 139 Ks, and an alarmingly high but Rockies-esque 4.58 ERA. Unfortunately, those are his stats from 1992-1994, and while his win-loss record looks quite impressive, Pinnacle made a significant error. His career record to that point was actually 17-16, meaning they dropped a full ten losses from his career count. When you feature a number that prominently, you really should get it right. Sadly for David Nied, he'd never win another game, wrapping up his career in 1996 with a 17-18 record. The next set is one you've seen a lot of around here, 1995 Score Summit. It's arrived in a few trades and even a Nachos Grande group break. 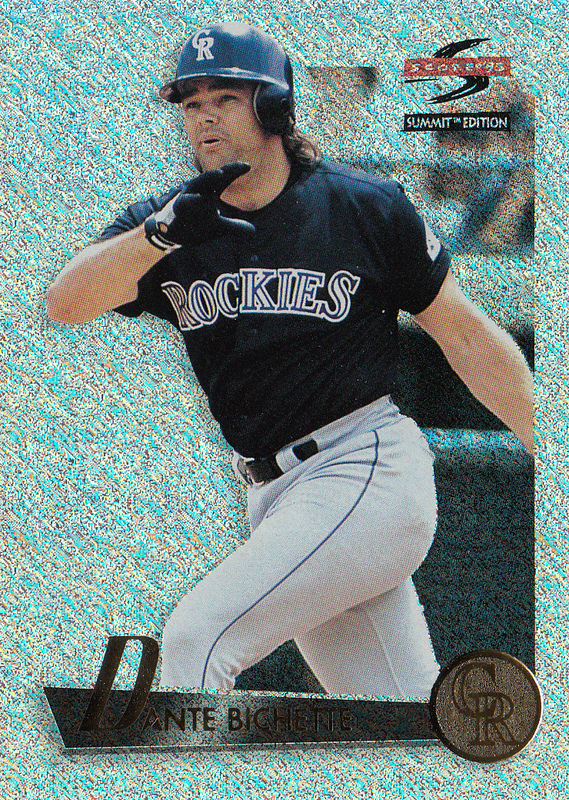 I don't believe I've shown the Larry Walker card from this year, though. These cards always surprise me in how thick they are, and the photo reproduction is really quite sharp. The gold medallion team logo is a bit hard to discern, but it catches the light well enough. The primary hit I got in this break was Dante Bichette's Nth Degree parallel, which is one of the most sparkly parallels out there. It's not new to my collection, arriving once upon a time from everyone's favorite French trader, to whom I send my condolences for the destruction suffered by the Notre Dame cathedral this week. I've shown the card before, but wanted to give my scanner another shot at it to have it turn out less blue than before. Success. Unlike Summit, 1995 Zenith is a rarity in my collection, occupying only two 9-pocket page slots in my vast collection. 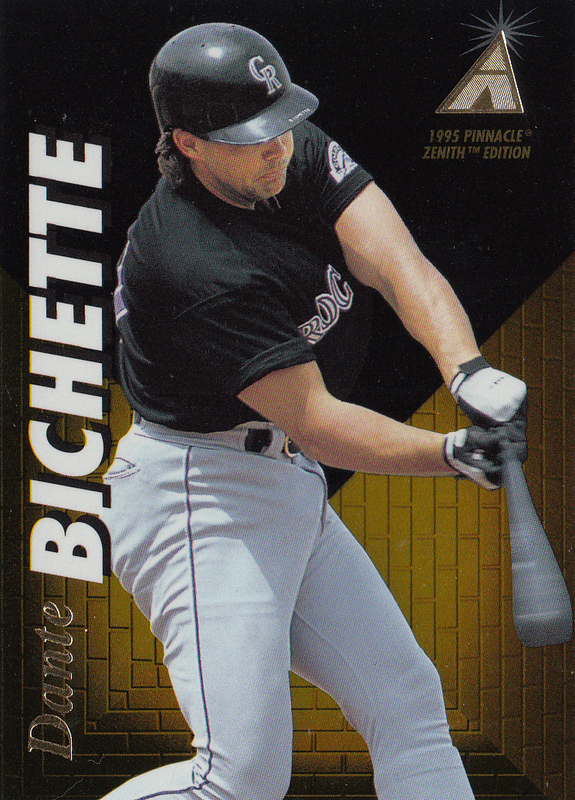 Dante Bichette got a card in this set too, and given the small size of all three of these sets (200 cards or less), there is quite a bit of player repetition. 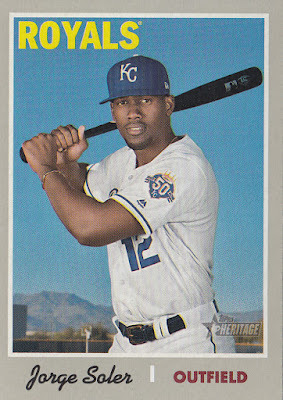 They might all even be from the same photo shoot, as Dante is shown in a black spring training jersey with an away uniform on both his Summit and Zenith cards. Summit and Zenith pretty much mean the same thing anyway, as does Pinnacle. The set names in 1995 probably came from a thesaurus. There was no Acme, but that would have worked as well. Gold foil was the name of the game in 1995, even hitting Topps flagship base cards for the first time. Pinnacle used the normal shade of gold for the various foil elements in this set, but I quite like the shade they used for the brick pyramid element in the background. It's a lot darker of a shade, more like honey, which manages to stand out among all the other gold sets of the era. The Rookie subset in Zenith didn't use the same shade, giving us lots more gold to look at, as well as a duplicated image as a backdrop for the main photo. 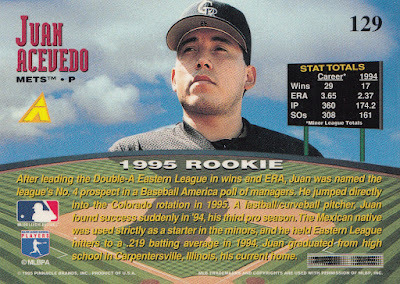 The card back gives us a nice write-up of Juan Acevedo's prospects on a baseball stadium-themed design, complete with an artificial shadow of the player's head being cast over the outfield. There's even a cute scoreboard with his statistics. It's more cartoony than 1993 Fleer Ultra, which had a similar theme, but Bichette's main set card makes great use of this layout, showing his spray chart to the various fields against both lefties and righties. Bichette managed one opposite-field home run in 1994, long before the phrase "oppo taco" came into use. 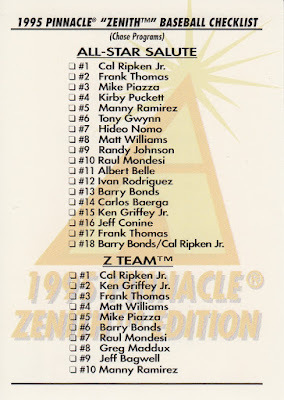 Colbey even included one of the checklists for 1995 Zenith, showing the full breakdown of the three insert sets. Looking over these names reminds you of a few you haven't heard in a while, like Carlos Baerga and Raul Mondesi. Plenty of others are now in the Hall of Fame. One of the three sets is "Rookie Roll Call". As usual with a set like that, it's peppered with now-legends like Derek Jeter and Chipper Jones, a few minor stars of the day like Todd Hollandsworth and LaTroy Hawkins, plus a few prospects that didn't especially pan out, such as Benji Gil and Bill Pulsipher. Only one Rockie made it into any of these insert sets, and that was Larry Walker. Given these small set sizes, it looks like I did pretty well as far as pulling full team sets. Summit was pretty far along already, but Zenith is going to need a few more pockets in the 1995 binder. This year's Topps Heritage begins a new decade, opening up the '70s with the gray-bordered 1970 set. I found a value pack at Target not long ago, and while I didn't pull the famed Pat Neshek card, where the sunglasses-wearing Phillies reliever pays homage to Lowell Palmer's card in '70 Topps, I did find one of the other cards from this set I had my eyes on. 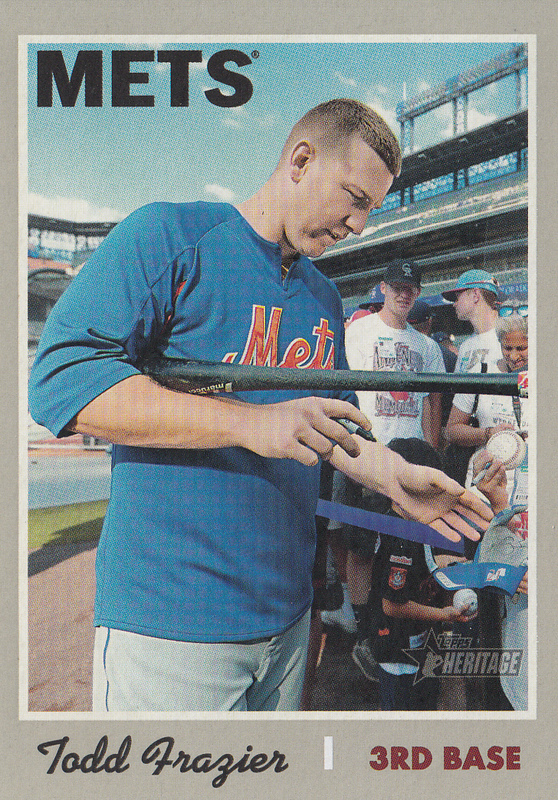 Todd Frazier, now on the Mets, got a fantastic card this year, showing him signing autographs in none other than Coors Field. It's rare for a card to show the upper portions of its distinctive architecture, but this wide-angle shot did it well. I'm pretty sure this is the first card out there that shows a glimpse of The Rooftop deck, which replaced a few thousand seats in upper right field in 2014. Even without knowing the look of the stadium, that fan with a Rockies cap just to Frazier's left is a dead giveaway. Pat Neshek wasn't the only one to give us a throwback to the 1970 set. Topps pointed out on Twitter that this one is reminiscent of Bud Harrelson's card, though that photo was taken in Shea Stadium, long before Coors Field was a figment of anyone's imagination. Coincidentally, the first-ever Rockies game occurred in Shea Stadium, on April 5th, 1993, though they'd need to wait for their first home game later that week to get their first win. I didn't pull anything earth-shattering in this pack, but I was pretty happy with the lone insert. Luckily, a Rockie found its way to me, and it's Trevor Story, one of the few bright spots in this year's season. Things have not been going well for them, as they are way down in last place already with a 5-12 record. Sunday's game was a gem, a one-hit shutout that also saw Nolan Arenado hit his first home run of the season, followed up by another one tonight. Story, on the other hand, has been flashing plenty of power since the beginning, already with four on the year. The New Age Performers insert set carries on for another year, and looks even more early-'70s than before. Topps compares the power-hitting shortstop to Rico Petrocelli, "an anomaly as a fence-busting shortstop" for the Red Sox, who hit 29 homers in his '70 campaign. That was actually a significant drop from 40 in 1969, his second of three All-Star years. Plenty of shortstops have proven to be power hitters since then, and Fernando Tatis, Jr, the hot-hitting rookie Padre squaring off against the Rockies this week, is rapidly adding his name to that list. Most Americans know April 15th as Tax Day, but those of us who are baseball fans take the day to celebrate Jackie Robinson Day. Everyone wears #42 on the field, forcing you to really know your team to know what's going on out there. They're also wearing a commemorative patch on the right sleeve today, a diamond with crossed bats surrounding the number 42. Jorge Soler has a team-specific patch on his uniform, worn during the 2018 season to commemorate the 50th season of Royals baseball. I know him better as a Cub, when he was a member of the team that finally broke the curse. His time on the Royals hasn't been as successful, but he's been healthy so far this season. 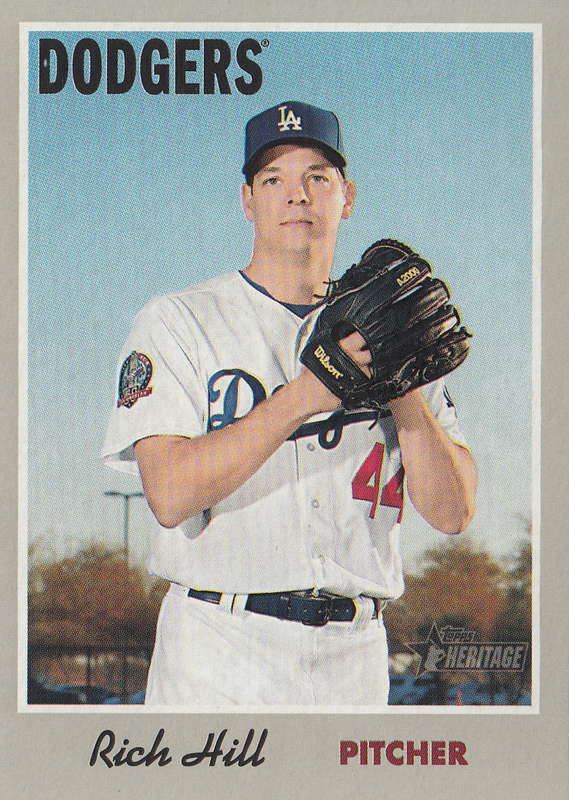 Rich Hill also wore a special patch last year with the Dodgers, marking their 60th anniversary of moving to Los Angeles. The veteran has statistics on the card back dating back to 2005, leaving no room for a cartoon or paragraph. He'll be adding another line to that resume shortly, but he still has a rehab start to make before he returns to both the Dodgers and my Fantasy team, the Lucky Numbers. The 2019 season is still quite young, but plenty has happened already. The Rockies have dug themselves quite a hole, the Mariners have an amazing home run streak going (which may end shortly), and Mike Clevinger has been bitten by the injury bug. He's expected to miss at least two months, which opens up a spot for Carlos González on the Indians' 40-man roster. 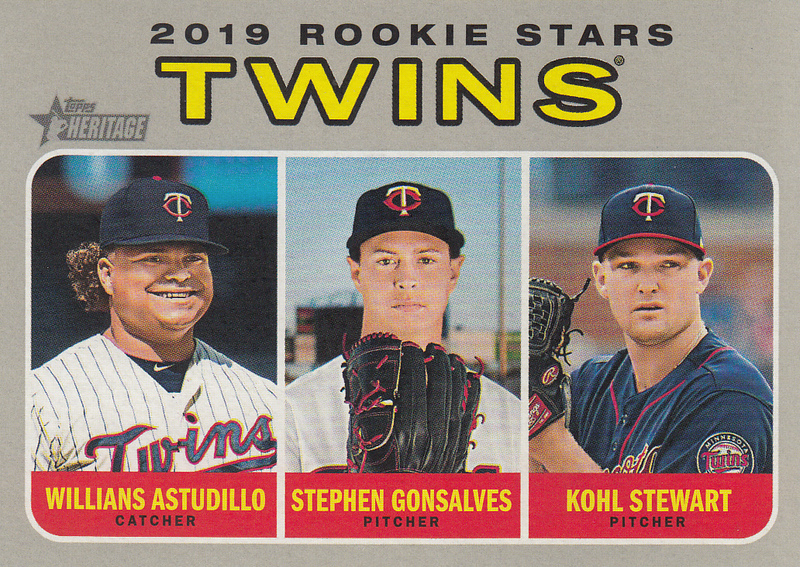 The set might be using a 49-year old design, and Topps is definitely going for a certain look with the photos, but there are a few things that show unmistakable progress. Major League Baseball in Denver, for one thing, and more Cuban players like Soler in the league. 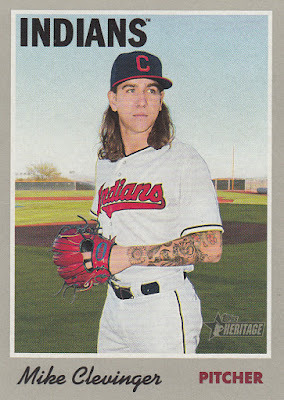 There may have been a handful of players with long-ish hair in the carefree days of 1970, but tattoos like Clevinger has are a much more recent development. There are Topps Heritage collectors that examine every aspect of the set in minute detail. Font size and placement, color shades, whether certain words are abbreviated or spelled out, and so on. 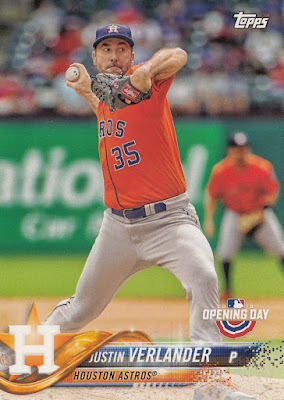 The only thing I really noticed is that some cards have a little vertical white bar (a "pipe" in techno-speak) between the name and position, and others, like both these pitchers, don't. The two-player Rookie Stars cards are faithfully reproduced in this year's Heritage. Vida Blue's and Thurman Munson's rookie cards both appeared on this design. 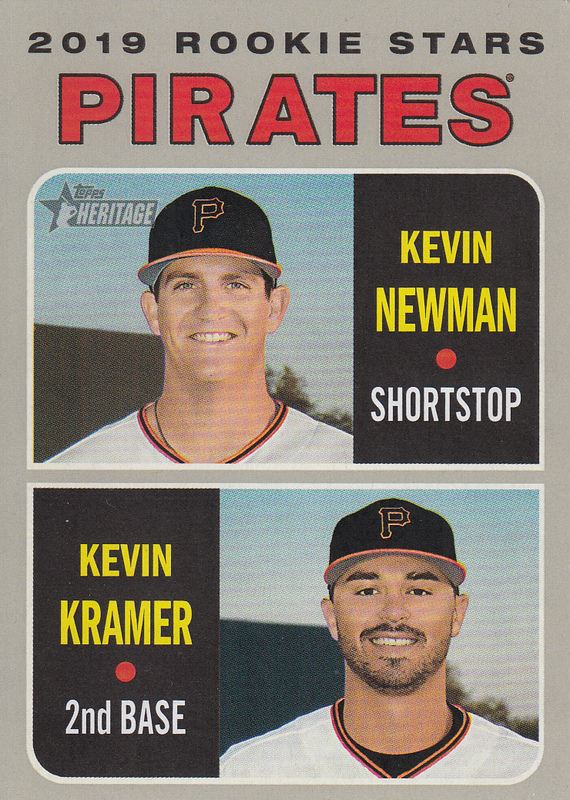 Kevin Newman, on the other hand, might not be mentioned with names like that given his early defensive performance. He committed three errors in a single inning against the Cubs a week or so ago. He's had a bright spot in his young career though, an extra-innings walk off a few days before. Newman shares a card with another Kevin, Kevin Kramer. His fellow middle infielder hasn't appeared yet in 2019, but did play a few September games with the Pirates last season. Nick Markakis, who surprisingly didn't have an All-Star selection until 2018, appears on the properly-named The Sporting News subset. None of that "The Topps News" knockoff anymore. He's certainly been worthy of a selection before, but it took him this long before fans recognized his talent, giving him the opportunity to appear on this All-Stars-only subset. There are no stats on the card back, just a large drawing of Markakis, his name, a small cartoon, and a mention that he has the all-time highest fielding percentage for right fielders, at .994. The card front shows him appearing to burst out of the newspaper in the background, and just to give you an idea of how I think, this reminds me of how the label looks on bags of Krunchers potato chips. They're so good. I haven't found them around here more than once or twice since I was a kid, though. Some teams have enough promising rookies to warrant a three-player card. I haven't heard of Stephen Gonsalves or Kohl Stewart, but Willians Astudillo is a 27-year-old utility player that's fast becoming a fan favorite. "La Tortuga" (the turtle) hit his first home run of the year in Philadelphia, but he's not really a power hitter. He's just that lovable guy who plays with a tremendous amount of heart. Even better, he pretty much never strikes out. He has exactly as many big league home runs as strikeouts. Four. Just look at that grin. This is a bit of a late post, but that's how the schedule tends to go for us fans out west. Both the Colorado Avalanche and Rockies had games starting at 8:00 pm Mountain tonight, and it'll probably be around 11 by the time I finish scanning and proofreading. The West Coast games are late for nearly everyone, but when I was in South Carolina for work last September, some of those Dodger games didn't wrap up until well after midnight. If you can tolerate that surprisingly few people on Eastern time have any idea how time zones work, Mountain time is really a nice compromise, even for a night person like myself. It's a beautiful Sunday afternoon, a great spring day with a full slate of baseball games on the schedule. So was yesterday, and while I did spend some time in the great outdoors, I'm sore and sunburned. Even though the weather looks great, I'm spending some time inside today to catch up on trade posts before I catch my first game of the season. The Rockies will be playing at Coors Field this evening, trying to avoid being swept by the Dodgers in their first Sunday Night Baseball home game since 2001. Win or lose, at least I won't have to listen to Alex Rodriguez announce the game or mispronounce Tony Wolters' name. There's plenty of time before gametime to get this post up, a small card stack sent by Jared of Cards My Mom Didn't Throw Out. In addition to these cards, Jared also included a sentimental handwritten note, mentioning that he thinks of me anytime he sees Rockies cards, as I was the first person he traded with, way back in late 2015. His blog is still going strong, and I'm flattered to know that I have enough influence in this community to inspire others. With that, let's see what shiny goodness Jared unearthed. 1998 Topps Finest returned to something resembling normalcy after the fractured set insanity we got in 1997. 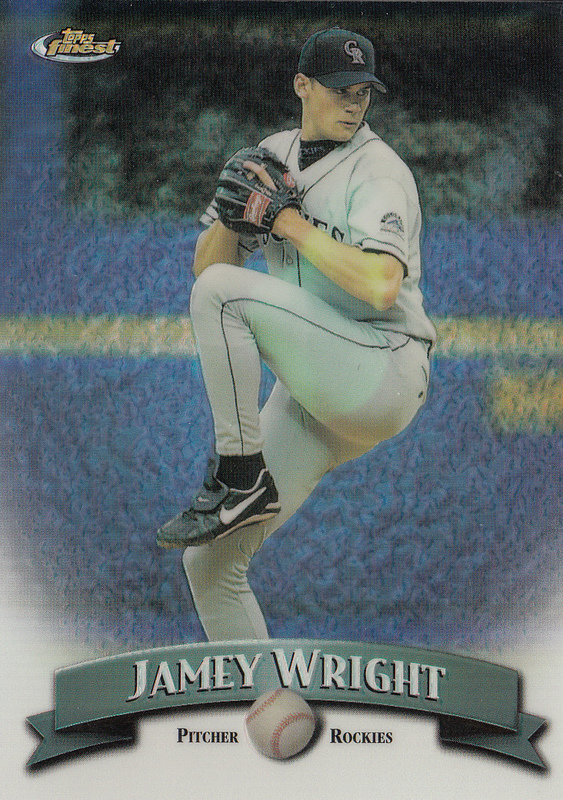 Jamey Wright's card #69 is just that, card #69. I'm still rather confused about what's happening with this card, though. I'm confident in stating that this is a Refractor card, as it has that unmistakable rainbow look, on both sides in fact. Beckett has a few varieties listed, including some as "No-Protectors". Presumably, these are cards which ship without that clear plastic peel-off coating. I always peel those anyway [insert sunburn joke here], but that doesn't just convert it into the other variety. From what I can tell, the protector cards have a normal back, and the No-Protector cards have the same shiny chrome finish on the back as on the front. How does that apply to refractors? Similar to the base cards, there are normal refractors, which have a refractor front and a normal back, differentiated only by a tiny "R" next to the card number. What I think Jared found for me is a No-Protector Refractor, as both sides have that glorious shiny rainbow finish. But here's where this keeps confusing me. Unlike the two normal refractors already in my collection, there's no "R" label on this one. Maybe Topps trusts that you'll be able to figure it out because both sides have the same finish, but then that calls into question two other cards in my collection. Those two have the "R" label, but don't look like refractors at all. If not for that "R" label, I'd group them with the base No-Protectors, because that's what they look like. But that "R" has to mean something, right? For now, I have them separate. Then again, they're clearly different than this Wright card, which lacks the label. In short, I have all four varieties to be found, but either the labeling is inconsistent, or Topps messed up the card stock somewhere along the line, or both. Even when it's not a fractured set, these late-'90s cards can really require some investigation to figure out what you have on your hands. The confusion continues with this shiny Todd Helton card from 2002. First and foremost, I've always been a Topps guy. And given the above situation, as well as all that mid-'90s Stadium Club that regularly makes me question my reality, even they can be tough to decipher. So when Donruss parallels of parallels show up from a time when I wasn't collecting, I just admire the color coding and look it up on Beckett again. Donruss made a set called Fan Club in 2002 for a single year. It has a faint graph paper pattern in the upper right and lower left, as well as some excellent color-coding. There's also a "Best Of" parallel set, which is more or less similar to Topps Chrome in appearance. Both the base and Best Of varieties have their own parallels with a /100 print run. The base parallels are called "Credits", and the Best Of "meta-parallels", for lack of a better word, are called "Spotlight". They don't look any different than regular Best Of cards other than that Spotlight lettering at the top. With those parallel names, I think they're going for some kind of movie theme, but there's not much else about the set that indicates it. Seeing 074/100 in red foil on the back is certainly cool, though. Like 1998 Finest, I've found enough of these over the years to have something to compare incoming cards to and see where the differences lie. Checking Beckett is a good first step, but if you don't have a few on hand already to compare and contrast, it might not be much help. Jumping way ahead to the current Rockies era, Charlie Blackmon allows me to show the 2016 design again, something some bloggers won't mind and others will quite dislike. What makes this special, obviously, is the "Limited Edition" gold lettering on the right side of the card, plus a much thicker card stock than usual. This is something I had no idea existed, and I told Jared as much in my thank-you email. This is from a premium factory set which Topps printed less than 1,000 of. It even came in a fancy silver box. Full sets on eBay are going for just under $100, which honestly seems like a bit of a deal with that small of a print run. And since I have just this one Blackmon, I know there is one fewer complete set out there. I'm not sure where my seats are tonight, but if they're along the first base line, I'll get a good view of Charlie, who is covering right this year following the departure of Carlos González. Elsewhere on the playing field is shortstop Trevor Story, who accepted his Silver Slugger award before yesterday's game, along with teammates Nolan Arenado and Germán Márquez. Of those three, only Story has yet to ink a long-term deal with the Rockies. It's hard to believe that it's been three years since Story was tearing up the league as a rookie, mashing seven homers in his first six big-league games. Once upon a time, his cards weren't found outside Bowman, and the power-hitting righty had to make do with a batting helmet with ear flaps on both sides. Story has certainly grown into the shortstop role, filling the shoes of Troy Tulowitzki. 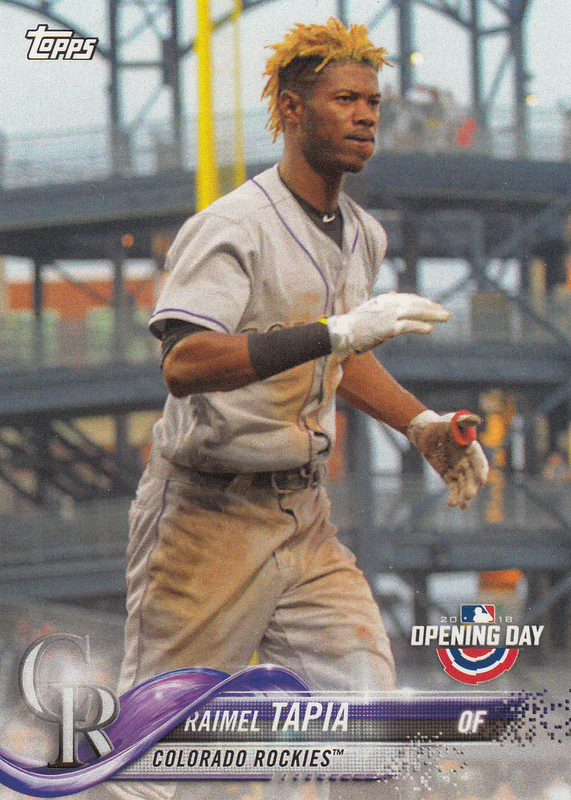 Back when this card was printed, Topps said, "The Rockies are keyed up about Troy's potential at shortstop." He became a fan favorite in Denver, but had injury problems and was eventually traded to Toronto. The Yankees took a chance on him, and he showed promise in spring training, but he only played in five games before straining his calf and landing on the Injured List. FYI, it's not called the "Disabled List" anymore. I've always liked Tulowitzki, but he's got to be wondering how much longer he can keep this up. He's an elite athlete, and it must be extremely frustrating for him not to be able to practice his craft the way he'd like. Even though he was the third-youngest player in Rockies history according to this 1958-themed Topps Heritage rookie card, he's starting to get up there in years. He's seven months younger than I am, and I'm learning that the body just doesn't bounce back the way it once did. It's not impossible that we'll see him back in purple pinstripes someday. The Rockies do like to sign past players once a few years pass. Mark Reynolds is back, Matt Holliday stopped by last year, Chris Iannetta is regularly starting behind the plate, and Jorge de la Rosa just inked a minor-league deal. 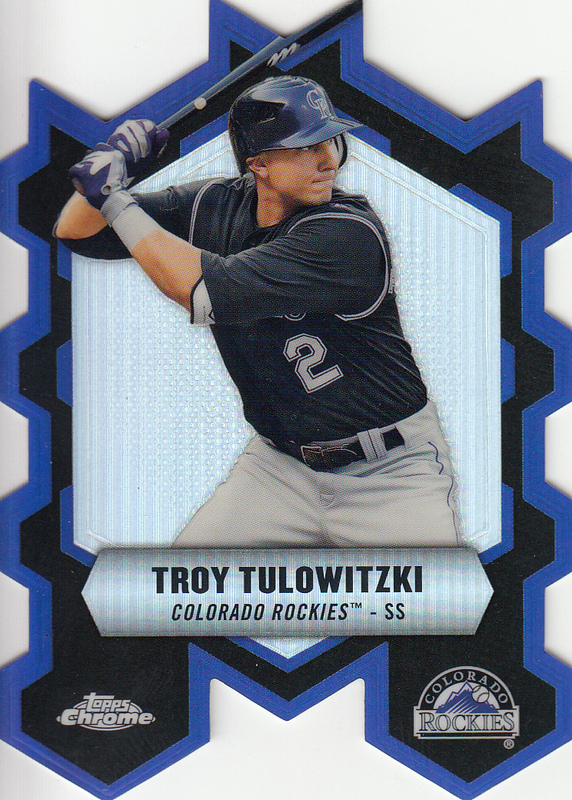 Long after his Rookie Card days, Tulo was established enough to warrant inclusion in small die-cut insert sets for brands like Topps Chrome. 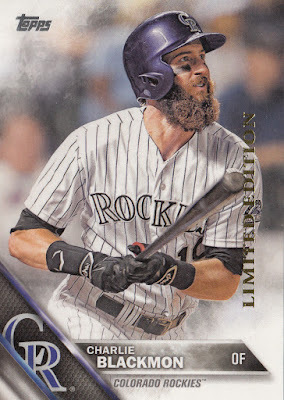 This completes my team set of 2013 Topps Chrome Connections, after CarGo's card that I received via trade from Alex long ago. I've seen the González die-cut a bunch of times (I even have two in the duplicates box if you want one), but Tulo's seems to be a bit more scarce, yet just as angular. When he's healthy, Tulowitzki is quite consistent. By the time this set came out, he had already had three seasons in which he hit .290 with 25 home runs and 90 RBIs. 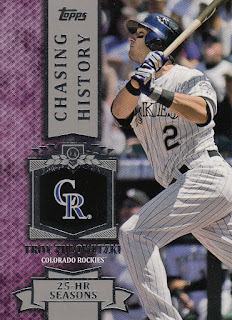 Topps tantalized us on the card back with the possibility of a fourth, which would tie him with Vinny Castilla in the Rockies encyclopedia. 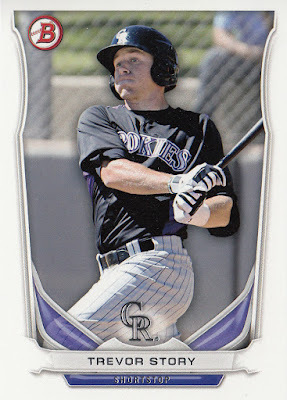 In 2013, sharing the left side of the diamond with rookie Nolan Arenado, he hit .312 and exactly matched that count of 25 homers, but fell eight short in the RBI column. 2016 was a decent year, but he hasn't been able to eclipse his 2013 numbers yet. 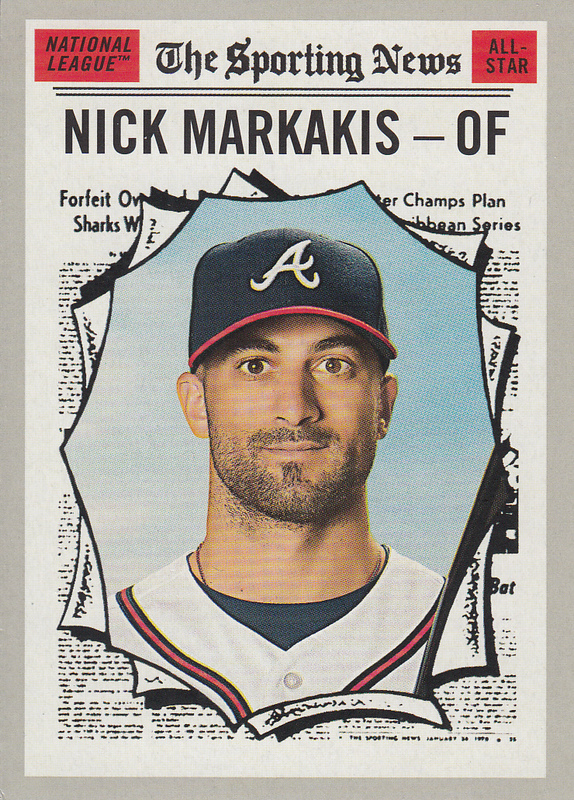 We'll wrap up with another die-cut, this one from 1997 Donruss. 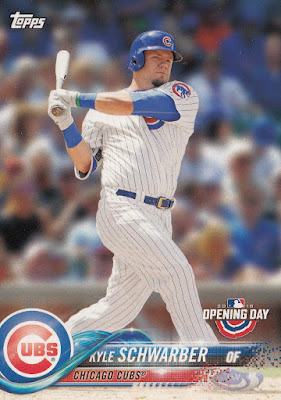 Rather than a multitude of corners and edges as in Chrome Connections, Donruss' die cut pattern is just a couple of right trapezoids, allowing for much easier handling and storage. As noted in a few places on this card, it's a Press Proof parallel, which had a print run of 2,000 in prior years. Those are still out there, and were called Silver Press Proofs in 1997. I don't have any in my collection, but there doesn't appear to be a die-cut involved. This shiny one is a new-for-1997 variety, the Gold Press Proof, which includes the aforementioned die cut and a print run of just 500. As far as Rockies shortstop prospects, Neifi Pérez blazed the way for guys like Tulo and Story. The card back called him "Colorado's addition to the list of top shortstop prospects who have reached the majors the past couple of seasons." Implicitly included in that list would be Derek Jeter, Alex Rodriguez, and Nomar Garciaparra. Also on the card back is a lesson in Postseason roster rules. We're told that the Rockies called up Pérez in time for him to be on the team's Postseason roster. That requires a player to be on the 25-man roster by August 31st. September call-ups are not eligible, but that's less important this season, as the expansion of September rosters has been greatly limited. Fortunately for Pérez, his debut was on August 31st, 1996. 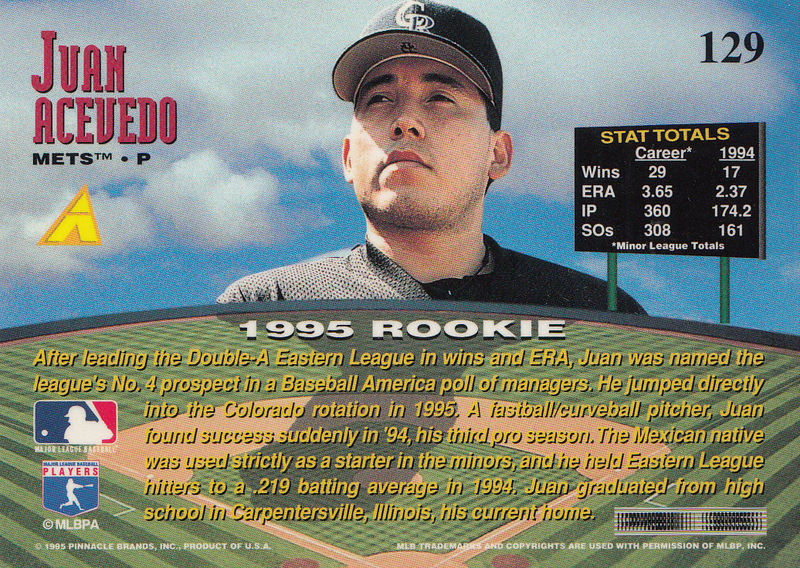 Unfortunately for Pérez, the Rockies didn't make the Postseason in 1996, so it was a moot point. Normally, a card like this would be a good candidate to find the specific date of the photo, but there's barely any clear information on the out-of-town scoreboard to go on, and worse, it's not clear who the cameo is diving back to second base. He's wearing uniform #29, but I really can't tell which team this is. The colors point to a couple possible American League candidates, most likely the White Sox or maybe the Yankees, but as this photo is from 1996 (confirmed by the "MDM" patch on Neifi's right sleeve), interleague play had not yet started. My best guess, but not with a high level of confidence, is that the cameo is a very young Bobby Abreu, then on the Houston Astros. The uniform number matches, the colors are maybe, possibly, consistent with the dark blue and gold the Astros wore in the mid-'90s, and Pérez did pinch-run and finish the game defensively against Houston on September 15, 1996. The Rockies issued two walks in the top of the 8th, forcing Abreu to second base. Shortly after that, the next batter lined out to the pitcher, and this play does have the look of the defense trying to double up the runner. Jared included a couple other cards as well, which were already in the collection. There was an even more purple Helton card from 2004 SP Prospects, and a Leaf Steel card of Larry Walker, which is a slight upgrade since the metal in that set is surprisingly fragile. Thanks for the cards, Jared! Every year, a team loses the World Series. For some teams, that happens a lot, but many of them have the talent and good fortune to go on and win in other years. Others aren't quite so lucky. In response to Collecting Cutch's contest, in which he asks bloggers to recall a year in which their favorite team didn't win the World Series, the Cardsphere has turned out a batch of excellent posts. There are a few ways to interpret this contest, such as picking a year in which your team had no chance of going anywhere. Finishing in last place with 58 wins is technically one way to "not win the World Series". But entrants tended to pick a season in which their team came oh-so-close to winning it all. Teams like the 2003 Yankees, 1996 Braves, and 1990 Athletics simply lost the Series. The 1980 Dodgers, 2003 Red Sox, 1960 Orioles, and 2016 Red Sox fell varying lengths short of winning the pennant, or short of even making it to the postseason. The Rockies have never won their division, but they came extremely close in 2018. For Rockies fans, a playoff appearance has always been a question of "will we win the Wild Card?" That's happened five times. And one of those years, they did the improbable and not only advanced to the NLCS, but made it all the way to the World Series. That year was 2007, also the year of one of the least-favorite Upper Deck base sets ever. 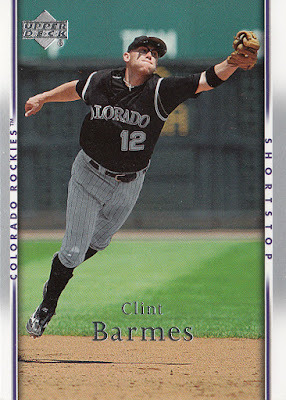 Clint Barmes was a middle infielder with a few seasons under his belt, but it all came crashing down in 2007. Despite what Upper Deck tells us, that "Barmes has consistently upped his production", his 2007 campaign was one to forget, and one that he spent most of with Triple-A Colorado Springs. He did get called back up in early August, but didn't appear on the Rockies postseason roster until their next Wild Card, in 2009. Upper Deck did manage to give him a great action shot, which they squeezed in between the columns on both sides. His glove looks a little flat, so it's possible that this lunge didn't quite snag the ball, but we'll never know because the border cuts it off. It's appropriate for this championship that fell just out of reach. A large reason why Barmes had a forgettable 2007 season was this man, Troy Tulowitzki. The talented shortstop was an enormous reason why the Rockies did as well as they did, and he almost won the NL Rookie of the Year award. He made a strong case for Barmes' starting spot, and even managed to turn an unassisted triple play in just his 46th game in the Big Leagues, as this Topps Update card documents (but does not depict). Footage of the actual play shows Tulo wearing a different uniform than the purple jersey. I've mentioned this before, but I was at the game the day before that rare event happened to occur. It was against the Braves, and while I got to see future Hall-of-Famer John Smoltz pitch, it would have been amazing to see another future Hall-of-Famer, Chipper Jones, line in to such a play. It was my first of four games I attended that season, and the familiar chant of "Tu-Lo!" echoing across Coors Field graced the ballpark for many years to come, even when he visited Denver as a Blue Jay, another game I attended. Part of why the 2007 season was so amazing is that even the regular guys did pretty well. Journeyman utility player Jamey Carroll spent two years in Denver, and his trip to the postseason in 2007 was the only one of his career. Even in hitter-friendly Coors Field, he didn't put up stellar numbers, but he did hit a pinch-hit grand slam during my second trip to the ballpark that year, a work outing against the Cubs that the Rockies won in blowout fashion. I had a new camera by then, and snapped a shot of the center field fountains that were activated after that home run. He also drove in the winning run in the 2007 NL Wild Card Tiebreaker game. More on that later. 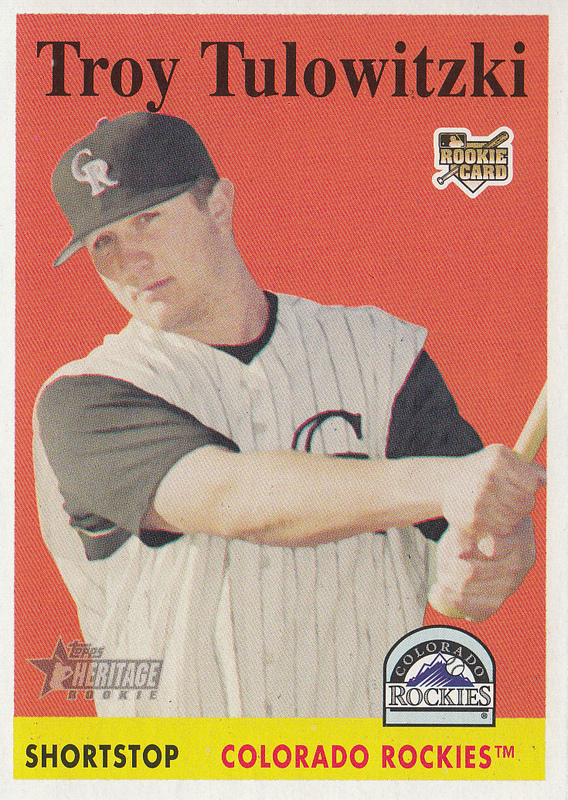 The Rockies have put plenty of great fielders on the diamond, and the back of this '58-design Topps Heritage card tells us that Carroll had a stellar .995 fielding percentage in 2006, the best among NL second basemen. Cory Sullivan was once tasked with patrolling the jumbo-sized center field bordering that fountain, and he did well, as I recall. I don't remember any home run-robbing plays like Ian Desmond flashed the other night, but he had the speed to do it. Longtime readers might remember him as the player who hit two triples in one inning a year prior. He's still well-known among Rockies fans, as he's an in-studio host for the Rockies' TV network. 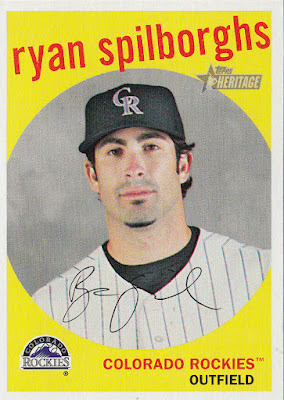 Ryan Spilborghs shared outfield duties with Sullivan, and "Spilly" remains a fixture in the Rockies broadcast booth to this day, even though his career ended in 2011. He started in center field that day against the Cubs, and I took this picture of him casting a shadow on the outfield grass. I was a real shutterbug back then, and that photo still graces the banner of my blog's Facebook page. It's one of my favorite photos, and I took it from one of the top rows of the center field bleachers. I tried really hard to only use cards from 2007 in this post, but I couldn't find a card of Spilborghs in the 2007 binder, so I had to advance one year. The 1959 design is one of my favorites, but it took a while for Topps to place him in more than a small number of sets. I could go on with guys like this all day. Seth Smith, Jeff Baker, Kaz Matsui, Yorvit Torrealba, Willy Taveras. They weren't superstars, but they got on base, got key hits, and came through in the clutch. The Rockies are never going to be a team full of top-dollar free agents, so for them to have success, they need the right mix of average utility players that pull more than their weight and come through at the right time. When that happens, they tend to do pretty well. Exactly that happened last year in the Wild Card Game against the Cubs. In the extra-innings pitchers duel, none other than Tony Wolters got the game-winning hit. ESPN couldn't even say his name right. The Rockies have always been such an offense-driven club, but their pitching was quite good in 2007. 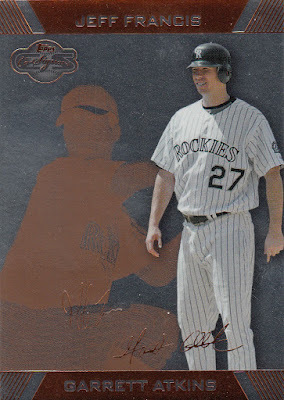 The staff ace was Jeff Francis, who shares some ghostly card space with third baseman Garrett Atkins. This bronze Topps Co-Signers card was sent to me long ago by Wes, before his recent retirement and even before a couple blog name changes. 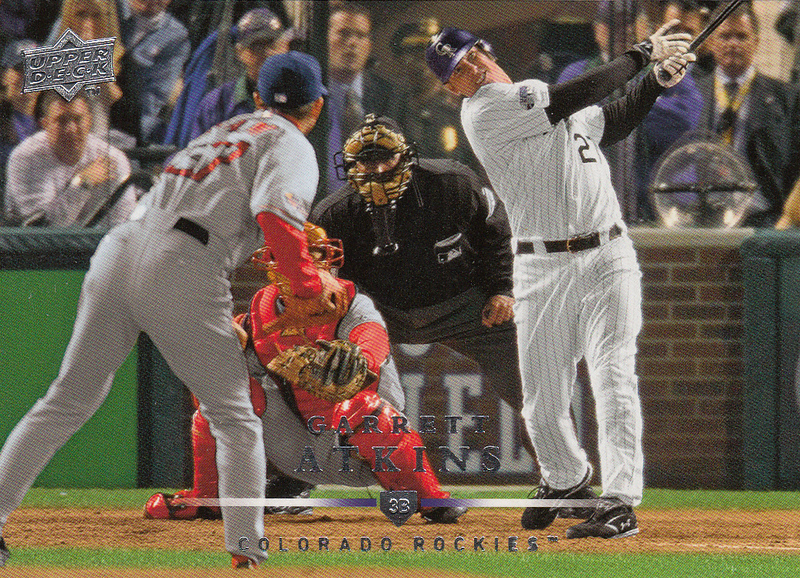 Atkins was a middle-of-the-lineup guy, and he rewarded the Rockies with 25 home runs in '07. 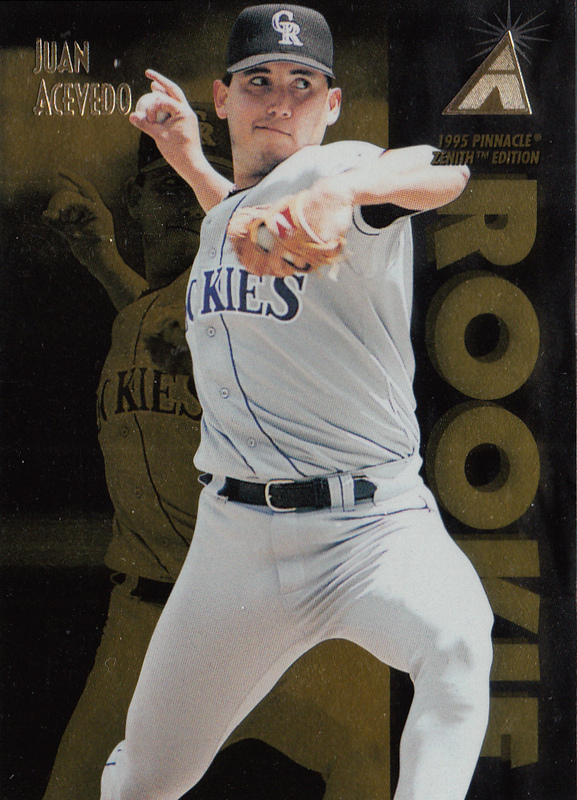 More importantly, Jeff Francis went 17-9 that year, putting him in a four-way tie for second place on the Rockies single-season wins leaderboard. It wasn't until 2010, but Ubaldo Jimenez eventually eclipsed that record, winning 19 games. No Rockie has ever cracked the 20-win mark, but there are pitchers in the rotation right now who are capable of doing just that. Kyle Freeland already has one and it's just the first day of April. 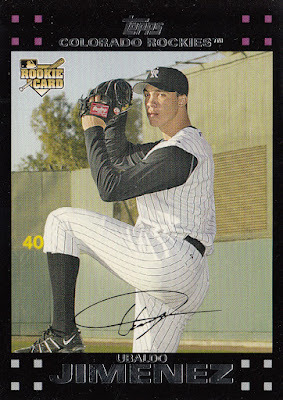 Jimenez had two relief appearances in 2006, but he really got going as a member of the rotation in 2007. He and Tulowitzki gave fans a glimpse of what the Rockies would be like for several years to come. It was a young team. Of all these players so far, Clint Barmes had the most experience as a Rockie, and he was only in his fifth year. 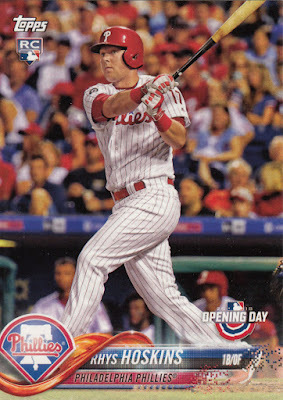 2007 Fleer Ultra, the final Ultra set to grace the hobby, had a card back very similar to 2007 Upper Deck. 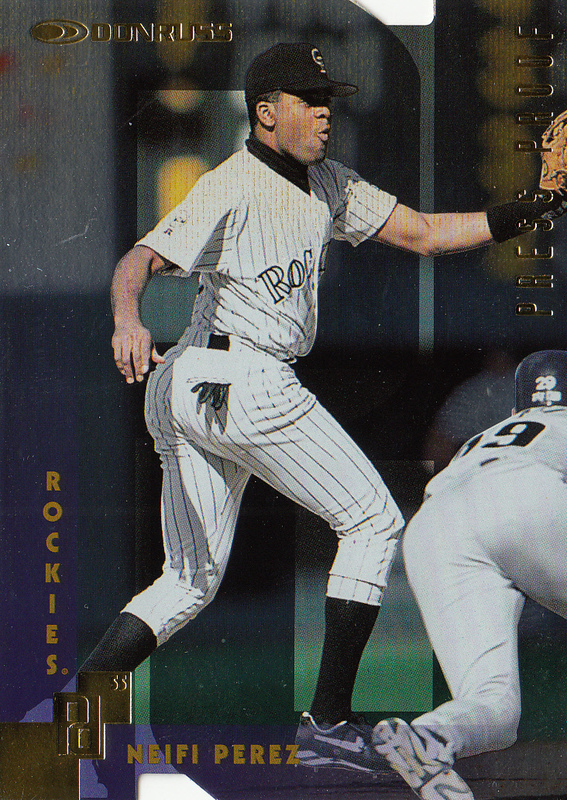 There is a ton of empty white space on that back, but room enough for Fleer (really UD by that time) to tell us that the right fielder was "Part of a rising young core of hitters for Colorado". 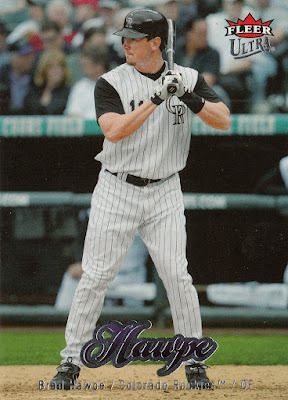 Hawpe hit even more dingers in 2007 than Atkins, with 29, a career high. I love Coors Field cards, and these lefties really get great ones. When they're at the plate, we can see right into the Rockies dugout, which is more or less an extremely close-up version of what I see when I go to the ballpark. I tend to favor the third-base side, mainly to keep the sun out of my face, but it's also nice to see my team while they're not on the field. Speaking of right field, this is a good time to bring up the third game I attended in 2007. It was an early-September night game against the San Francisco Giants, my first time seeing them play. If memory serves, I was was there with my dad and sister, and we sat out in right field, above the out-of-town scoreboard and underneath the overhang. That was fortunate, because if I'm thinking of the right game, it was rainy. I don't remember a delay, just a cold and wet night. Brad Hawpe was the closest player on the field to us, and while he had a hit, the Giants won that night. I even witnessed one of Barry Bonds' 762 home runs. Other than Tulowitzki and maybe the two pitchers, casual Rockies fans probably haven't heard of most of these players, or maybe they don't have the context that current broadcasters Sullivan and Spilborghs used to play for the team. We got pretty deep into this post before I got around to the big names, and they're plenty important to the cause, but this is a team sport first and foremost. Mike Trout, who has better stats than anyone by their age-27 season, has played in a grand total of three Postseason games so far. The Angels are on the upswing, but baseball is a sport where a superstar really needs his teammates to shine. 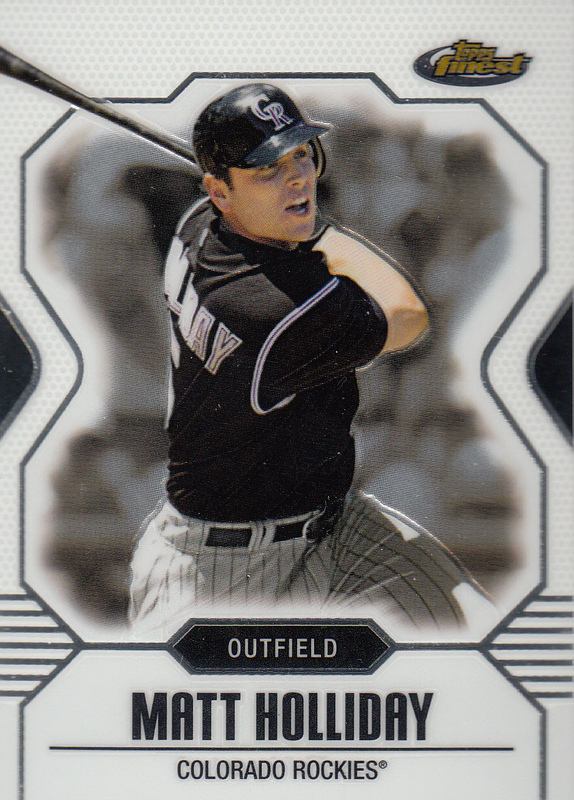 Topps Finest has always been a pretty small set, so only the big names like Matt Holliday get included. The power hitter led the 2007 team with 36 home runs and 120 runs scored, the last one being pivotal to win game 163 and eclipse the Padres to win the Wild Card. It's easily the most controversial play in Rockies history and, to be honest, probably wouldn't pass replay review in this day and age. It's important to note, though, that Garrett Atkins hit a home run in the 7th inning that evening that was incorrectly ruled a double. If replay review existed, the game would have been over in regulation. But no one really talks about that. Either way, the call in the 13th inning went the Rockies' way, and he remained such a fan favorite that the Rockies brought him back for the last couple months of 2018. He even appeared on last year's postseason roster, going 2-for-8 and bringing a ton of postseason experience to the clubhouse. 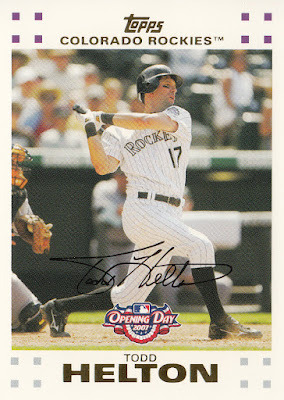 And here's that last big name you've been expecting all along, Todd Helton. 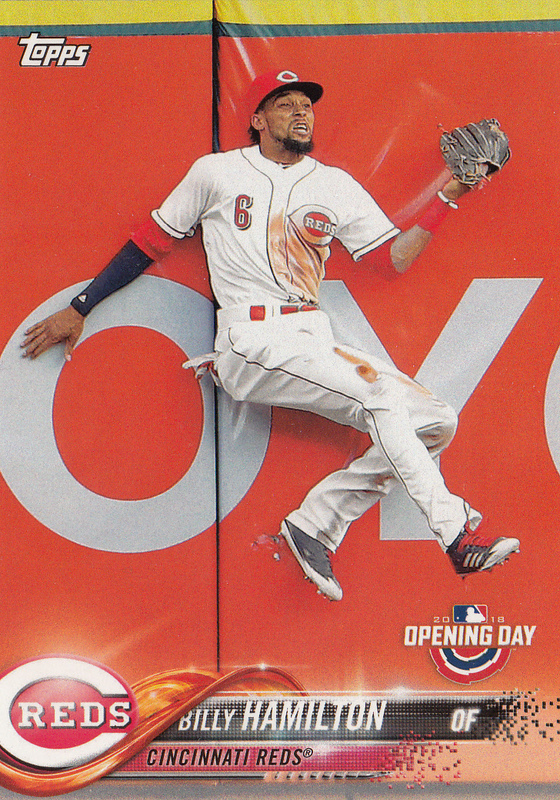 I've used a lot of 2007 Topps in this post, so here's a look at the white-and-gold interpretation of the filmstrip design, courtesy of Topps Opening Day. 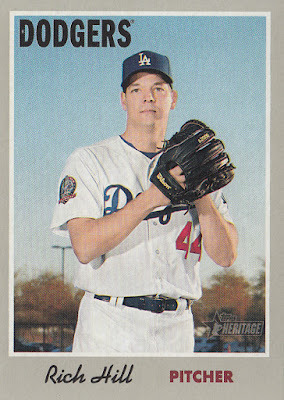 Helton, whose number 17 has since been retired by the club, is the most well-known player on this whole team. 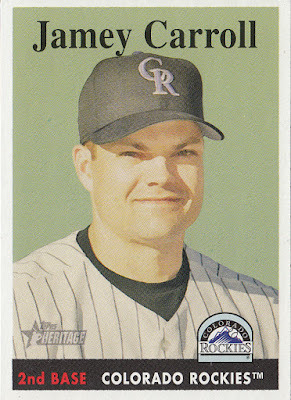 He had been in the Majors for quite some time before he got a taste of the Postseason, and was an integral part of the Rockies sweeping both the NLDS and NLCS before encountering the buzzsaw that was the Boston Red Sox. That brings us to the final game I saw in 2007, Game 3 of the World Series. My boss got tickets from a business contact, and decided to take me, the resident baseball fan, to the game. 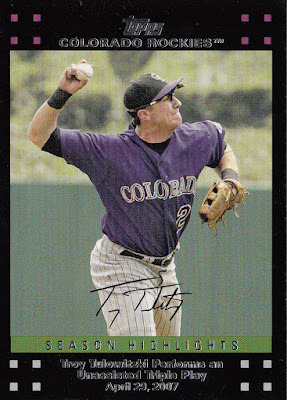 This card is one of the great Coors Field cards, and I dipped into the 2008 binder a second time to find it. That's Hideki Okajima on the hill for Boston, and he faced Garrett Atkins twice, once each in Games 3 and 4. Atkins struck out in Game 3, but took Okajima deep in Game 4, bringing the Rockies to within 1 run of Boston. It would be the last run they'd score that series. This card might depict that home run, which I think would be preferable for a card of a Rockie, but it might depict that strikeout in Game 3, which would be pretty awesome for this baseball fan. Other than Topps Now, I've only found one card from a game I attended. 50/50 that this is another one, and what a game it was. Even though they lost, it is a magical experience to watch your team play in a World Series. Yes, I had my camera. And I'll never forget it. Still, it would be great to win one of these. The nice thing about eBay notifications is that every so often, you get a free $5 coupon, good toward anything on the site. I've seen these a time or two, and I especially like that they don't mandate a minimum larger purchase. As long as you're at $5.01, you're good to go. One of these coupons went out earlier this month, and I used it to pick up two cards, including shipping. My total out-of-pocket was a mere 99 cents. As part of a longtime goal I've had to complete a rainbow, I ordered the mini version of Troy Tulowitzki's 2013 Chasing History card. It's been on the Eight Men Out list for a while, and might be the first that I flat out just decided to buy for myself. On the other hand, I guess you could say eBay bought it for me. This is the last one I needed to complete the rainbow. In my collection, that includes the full-size base card, the silver holofoil, the gold holofoil, and the relic. According to Beckett, there is a gold relic out there, but I'm most likely just going to call this good. Getting into the business of completing rainbows is dangerous and expensive territory to tread, and even that type of collector probably has to get used to writing off the printing plates and other 1/1s more often than not. In all that time since these cards started coming my way (spanning almost the whole history of this blog), Tulo was traded to Toronto, and then was signed by New York. This card documents his 25-HR seasons, but Topps jinxed this too, as he hasn't put one up since. He came within a hair's breadth in 2016, hitting 24 as a member of the Blue Jays. 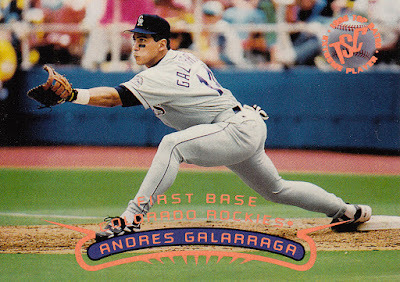 The other card I ordered was an Andres Galarraga card from 1996 Stadium Club. What I actually ordered was the Members Only parallel, but the seller appears to have goofed and sent, uh, something else. Something I did not know existed. Shocking, I know. Every time something turns up from this set, I basically question my whole reality. Because I have learned, time and time again, that I actually have no clue when it comes to mid-'90s Stadium Club. Presumably, neither does the seller, but I really can't say I'm too upset about it. It's not worth the time and trouble to correct for 49 cents, and the Members Only cards back then are much more plentiful than the needle-in-a-haystack case hits they are today. Instead, it's just yet another surprise from the rich vein of 1996 Stadium Club, and frankly, 49 cents is a bargain for another surprise. So what the heck is this thing anyway? What we're looking at is a Bronze-level winner card from the Extreme Players contest. Topps printed a 180-card partial parallel set in Gold, Silver, and Bronze. When the 1996 season concluded, Topps ran a formula against those 180 players, and the top ten players' cards became redeemable for a ten-card Extreme Winners set featuring those ten players, matching whichever metal color your redemption card was. Galarraga's 1996 stats plugged into that formula resulted in an Extreme Player score of 28.84, topping other first basemen like Mo Vaughn, Frank Thomas, Mark McGwire, and Jeff Bagwell. 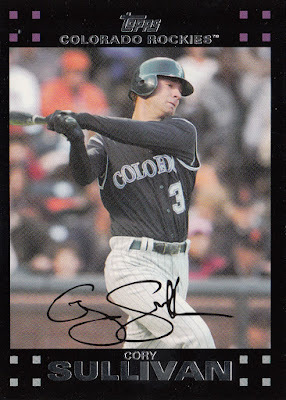 Whoever redeemed Galarraga's bronze card in late 1996 got this in return, along with nine others. 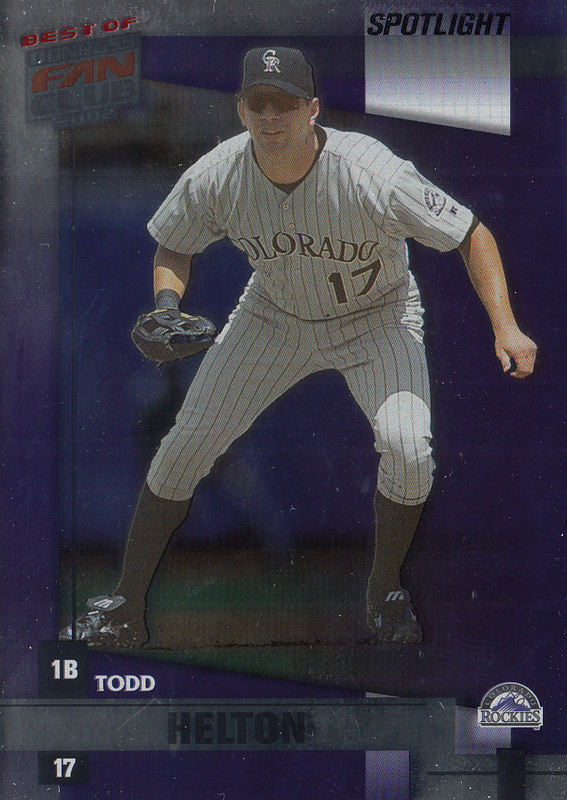 The foil is a rainbow bronze, and the lettering around the TSC logo says "1996 Top Rated Extreme Player". Returning to the card back, we're told that you'd have to go back to Ted Kluszewski in 1954 to find a first baseman who led the NL in homers with more than Galarraga's count of 47. Upon closer investigation of my 1996 binder, I actually have one of the redemption cards. Unfortunately, Johnny Damon's performance in 1996 finished in the lower 170 among Extreme Player (EP) candidates, forever leaving this redemption card as a what-if in my collection. It looks familiar, and it's probably been in my collection for a while. The large foil seal denotes it as a redemption card (Silver-level, no less), and it differs from normal 1996 Stadium Club cards by including the position above the player's name. Hypothetically, if Damon had a better EP Score at Center Field than Ken Griffey, Jr., this could have been redeemed for the Silver Winner cards. We know what the Bronze Winner cards look like, but what about Silver? Turns out I have one of those too. 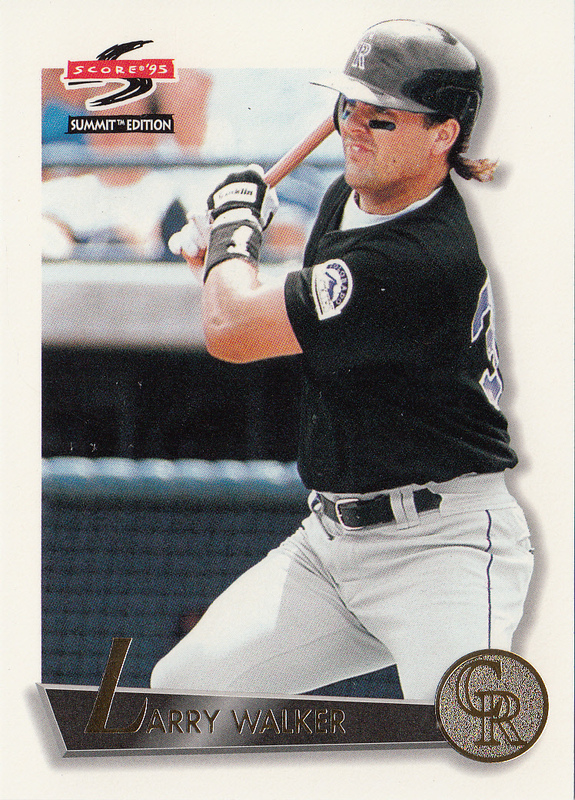 I have no idea where it came from, but this Chuck Knoblauch card was once in the possession of a collector who drew a better ticket in the Silver redemption contest than I did. Knoblauch sat atop the second base rankings that year, edging out Eric Young, Roberto Alomar, Craig Biggio, and Ray Durham. 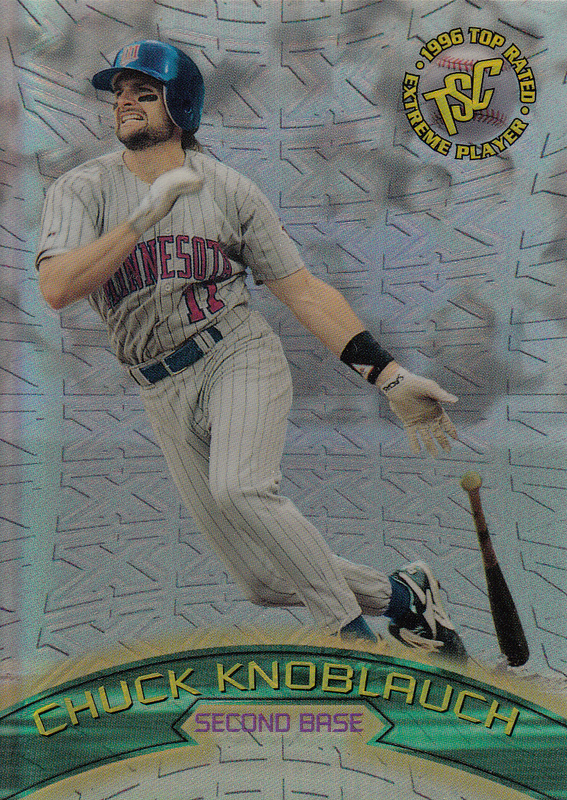 Eric Young almost joined his teammate in the 10-card set, but didn't have the power to out-hit Knoblauch. Side note, a fun fact I learned during my 2015 trip to Vienna is that "Knoblauch" directly translates to "garlic". 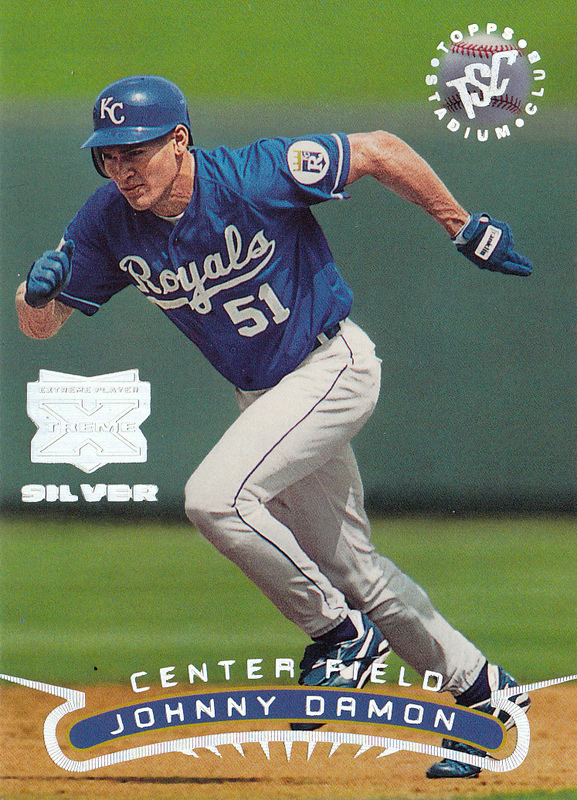 The Silver Winner cards are obviously quite a bit different from what we're used to from 1996 Stadium Club. It's a lot more like a Finest card or a Chrome Refractor, and the background has a repeating pattern of the same "X" lettering that is found on the redemption cards. Someday, I should just buy a box or two of 1995 or 1996 Stadium Club and better educate myself on what these sets are all about. But these surprises are much too fun. In my annual examination of a blaster of Opening Day, we already saw some of my favorite base cards. Now, it's time for the fun stuff, the insert sets that consistently keep me coming back year after year. Chief among that fun stuff are mascot cards, although Topps is reaching a little bit here. The Angels are one of just three teams without an official mascot, the others being the Dodgers and Yankees. The Rally Monkey is just a fan favorite, but isn't officially part of the team. It began in 2000 during a come-from-behind win the Angels put together on June 6th, 2000. The Rally Monkey was just a graphic on the Jumbotron, but the Angels pulled of a win, forever immortalizing itself in Angels lore. 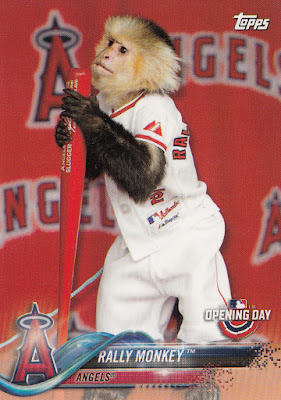 That win came against the Giants, setting the stage for the Rally Monkey to gain national popularity when those two teams met in the 2002 World Series, and giving Topps another card in their long-running Mascots insert set. There's even a little cartoon on the card back showing a monkey swinging a bat, but he is way, way too late on the pitch since the ball is already in the frame. This all looks quite official to me, so maybe the Angels should look into turning the monkey into an actual mascot and join 27 other teams in the trend. 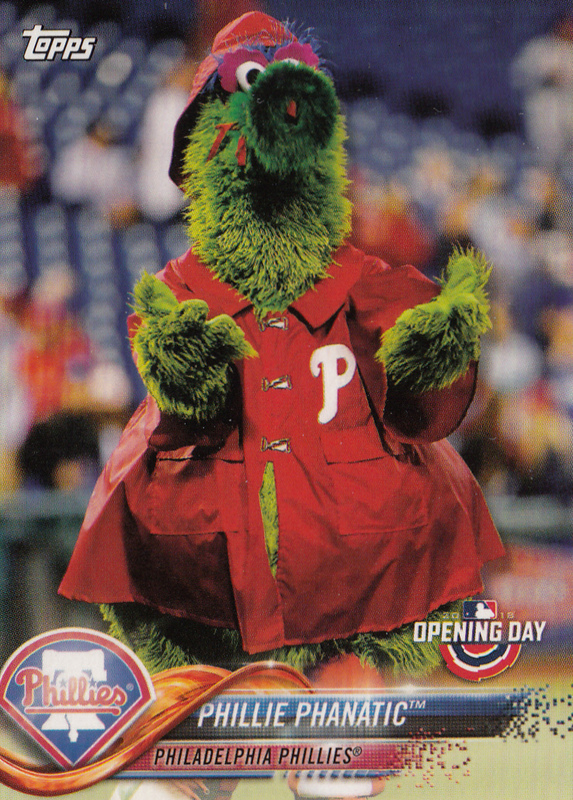 The Phillie Phanatic is the textbook example of a baseball mascot, although I think Orbit really doesn't get the credit he deserves. 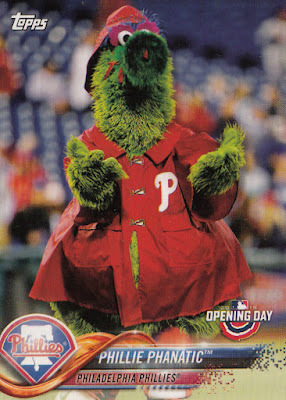 Still, the Phanatic is a favorite year after year, maybe even the GOAT when it comes to mascots. This card mentions that he likes to "play practical jokes on broadcasters." Have a look at an example to see what Topps is talking about. This mascot seems to have an outfit for every occasion, such as this red raincoat, which presumably comes out to keep the fans entertained during rain delays. With Bryce Harper joining the Phillies, I can't wait to see what antics they get up to in the next thirteen years. This blaster yielded a nice variety of the many insert sets Topps put out last year. I didn't find all of them, but there was a good sampling. Opening Day Stars is still being printed, but it's changed a lot from past years. It used to be an example of 3-D lenticular awesomeness, but no longer. 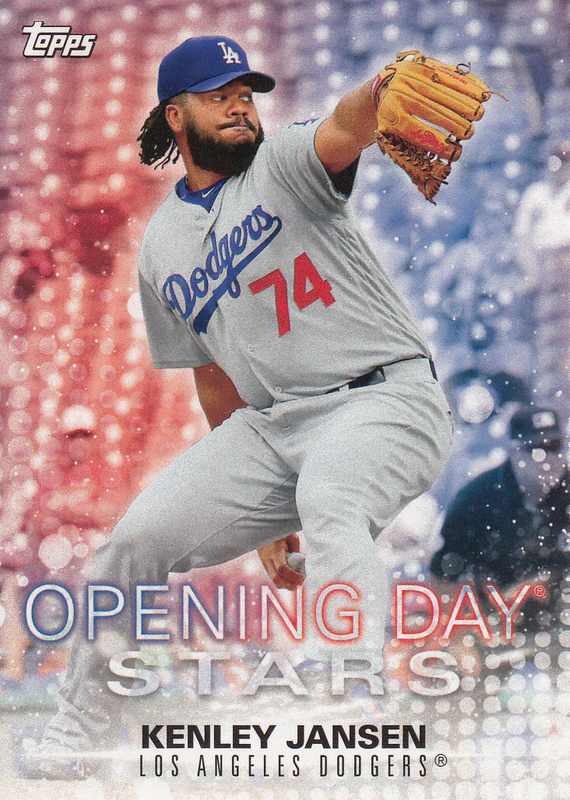 It's now a rather plain set, printed on flimsy card stock, and not much is happening on the back besides an oversized Opening Day logo and Kenley Jansen's name and team. I'm not 100% certain this isn't a sticker. I'm not sure where Jansen is pitching in this game, but he appears to be playing in front of a whole mess of empty seats. I'm guessing it's a save situation, since Jansen is the Dodgers' closer, and my best bet is that it's not a Freeway Series against Anaheim, as there is no Rally Monkey in sight. Only an umpire in the lower right and a few diehard fans. I know he pitches for a rival team, but I'm sending my best wishes to him following his heart surgery over the winter. He's recovering well, and all signs point to him being ready for the start of the 2019 season. We know of several athletes that excel in multiple sports. Baseball and football tend to go together frequently, a combination that instantly reminds us of players like Bo Jackson and Deion Sanders. Some NFL players' baseball exploits are lesser known, like Russell Wilson and Tim Tebow. There are some more unexpected combinations out there, like Lolo Jones in both track & field and bobsledding. 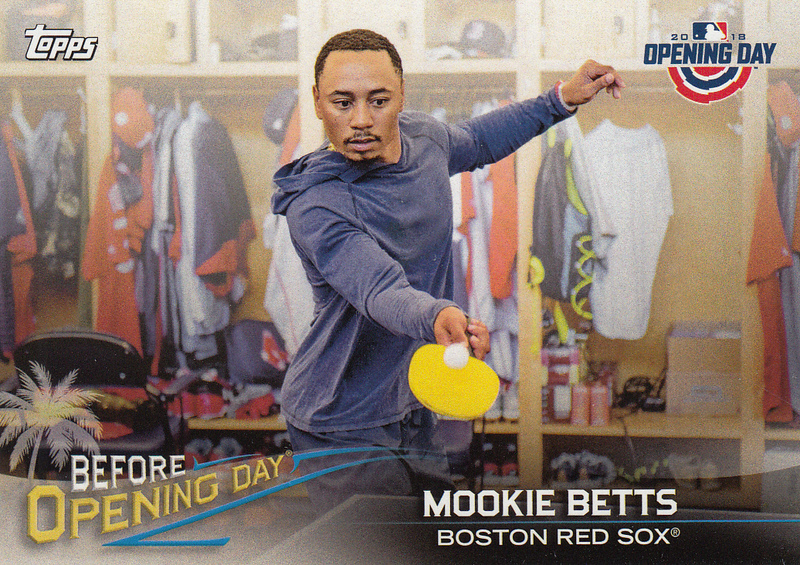 This Before Opening Day insert card shows Betts in the clubhouse playing a little table tennis, but his real talent is bowling. 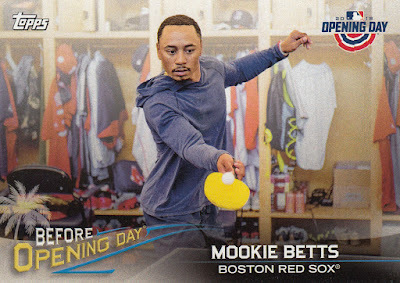 The card back tells us that the 2018 AL MVP bowled a perfect 300 in the World Series of Bowling, so if his baseball career falls on hard times, or a strike occurs in a year or so, Betts will have something to fall back on. Night Owl sent me the Rockies card from the At The Ballpark insert set not long ago, and I have the Rangers card to add to it. 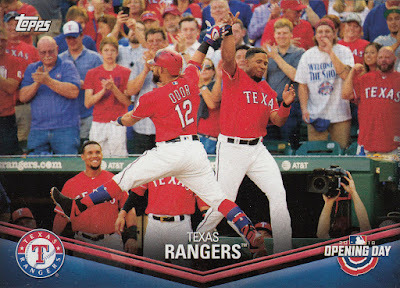 Rougned Odor, whose base card had that nifty bat barrel shot in Part 1, is clearly extremely excited about his most recent play. 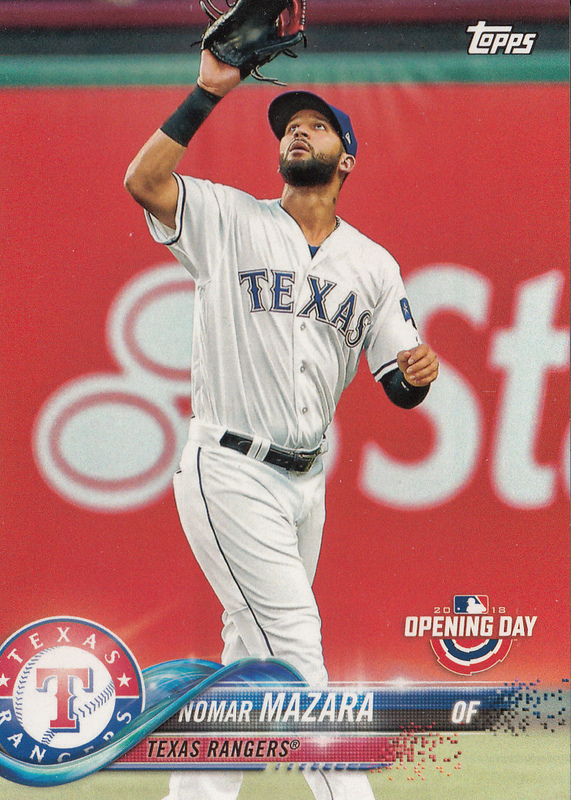 If this shot is really from April 3rd, 2017, the Rangers '17 season opener, it's probably following his three-run homer in the second inning off of Corey Kluber. The Rangers had the luck of opening their season at home. The Rockies almost never do, instead usually beginning their home season the following Friday. The season takes a little while to get going, but Lower Downtown Denver has really embraced opening weekend as an occasion for a big party. The last time I went to one was in 2014, the first time The Rooftop was open for business. That also happened to be the day that Charlie Blackmon went 6-for-6, one of the rarer baseball feats I've witnessed. Just like players find ways to keep themselves occupied in the offseason, stadium operators find ways to keep fans entertained between innings. That's certainly part of the Phillie Phanatic's job description, but there are plenty of other things to keep the attention of fans during the many two minute breaks. 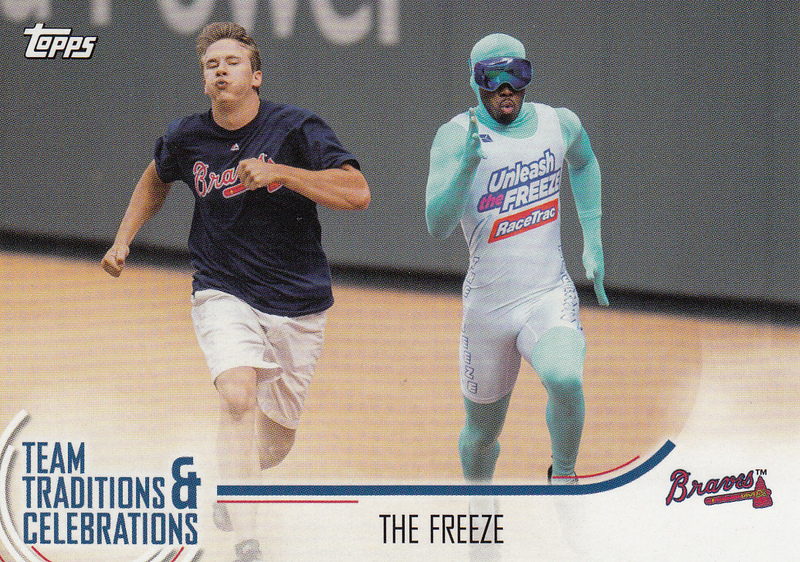 One such example can be found at Braves home games, an exciting footrace between a usually hapless fan and a former college track star nicknamed "The Freeze". Despite the fan having a massive headstart, The Freeze almost always wins. His real name is Nigel Talton, and he's also part of the Braves' grounds crew. It's way more interesting than a t-shirt cannon, and every once in a while, a fan manages to leg out a win. But usually not. The only trouble is that "Team Traditions and Celebrations" set name is an awkward mouthful. "Ballpark Fun" from a few years ago did the trick just fine, in my opinion. Last up is one of the un-numbered Blue Foil parallels with a limited print run. 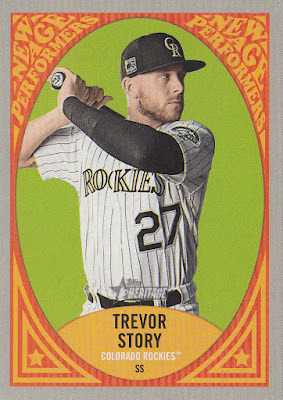 Topps did the same fountain shape in the background as they did in Chrome, developing a way to make a colored parallel out of a full bleed set. The date of "March 29th 2018" remains the only place you'll find foil in Opening Day. Twins outfielder Byron Buxton had a rough go of it in 2018, having trouble living up to his top-prospect billing. The center fielder has excellent speed, stealing 29 bases in 2017, and from the looks of it, he would have a real shot at beating The Freeze. That about does it for 2018 Opening Day. 2019's Opening Day product is on sale now, and I may even find one before the 2019 season begins on March 28th. You'll probably see a similar set of posts before long. I like this set too much to let it sit for a whole year again. 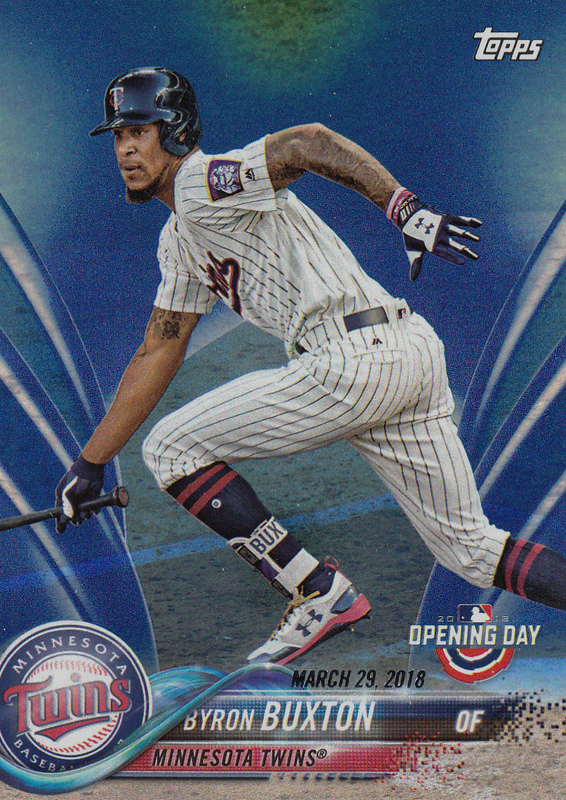 I didn't get a chance to write about last year's blaster of 2018 Topps Opening Day, and my plan was to squeeze in at least one post before 2019 was launched. For some reason, I thought 2019 Topps Opening Day was releasing on Tuesday, March 19th. Turns out, it came out a few days ago. What can I say? I'm behind. It wasn't until last night that I got my first pack of 2019 Heritage. The plus side of that delay is that I've had this awesome card staring up at me from my side table all year, an amazing action shot that a lot of people picked as their favorite from the 2018 "waterslide" design. That could be why I waited so long; I didn't want to put this card in the binder yet. Billy Hamilton is one of not many guys who still steals bases, and the speedy outfielder can clearly make it to the wall with time to spare. There's no weird cropping, no intrusive design, no smoke effect obscuring the brilliant red backdrop of a Toyota banner. This is full-bleed at its best. As usual with Opening Day, there isn't even any foil to distract you. Even the color-coding at the bottom works well for the Reds. Nomar Mazara's card is somewhat similar. The red banner is for State Farm rather than Toyota, and Texas' outfielder is a whole heck of a lot more relaxed than Hamilton while preparing for this catch. It's still technically an action shot; it just didn't become a hobby-wide favorite. I also like the way the Rangers logo is nestled at the base of the waterslide as if it just rolled right down it. A lot has been said about blurry backgrounds in recent years, but the backgrounds are clear enough on a few of these shots to make out the advertisements that companies shell out big bucks for. CVS Health has a spot on the Green Monster in Boston, which we can see behind a leaping Javier Baez, the Cubs second baseman who has the best tag application in the game. This double play card even has two cameos. Mookie Betts, last year's AL MVP, is #50 on the Red Sox, and I believe that is Baez' fellow middle infielder Addison Russell backing up the play. I'm not 100% sure on this one, but I think this is from the bottom of the 8th on April 29th, 2017. Betts began the inning with a leadoff single, but was forced out at second on a Hanley Ramirez grounder to short. Looks like the Russell-Baez duo did their best to turn two, but didn't quite get it done. That makes this a double play attempt card, which is somehow a little bit more awesome. It ended up not mattering, as Mitch Moreland grounded into one of his very own right after this play, although Baez wasn't involved in the 3-6-3 play. The Cubbies ended up winning 7-4. This set is just a year old, but already lots of players are moving around. Billy Hamilton will be a Royal this year, and Robinson Cano is back in New York, this time on the Mets. Still, I've always liked the Mariners colors, and their sea-green waterslide looks even more like something you'd see in a waterpark than some of the other colors in this set. Unfortunately for Cano, Topps kind of jinxed him with their write-up. We're told that he's eclipsed 30 doubles in a season for 13 straight seasons, something no one has done besides Stan Musial, and Cano has the distinction of beginning that streak in his rookie year. His suspension-shortened 2018 campaign only led to 22. I found quite a few Rangers in this blaster, and this one caught my eye thanks to it being a unplanned bat barrel shot. 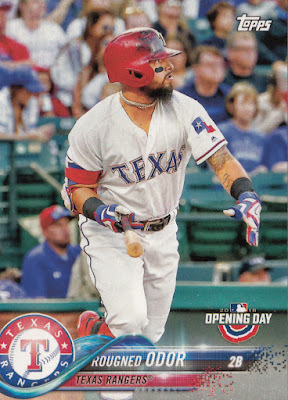 All eyes, including Rougned Odor's, are on the ball he just hit, but the photographer managed to snap a lucky shot of Odor routinely letting the bat slip out of his right hand. It's an easy shot to pose, but a lot of things have to line up perfectly to get it on an action shot. I'd bet that anyone with a bat barrel mini collection won't have too many action shots in there. Lots of 2018 Home Run Derby participants appeared in this blaster. Rhys Hoskins performed quite well, even making it to the second round. He had plenty of Major League playing time in 2017, so I'm not quite sure why Topps chose to only give us his 2017 minor league stat line on the back. The power hitter will be playing alongside Bryce Harper this year, and this young player is only going to get better. The black patch you see on Hoskins' right sleeve was worn by all Phillies in 2017, honoring Dallas Green, the manager who led the Phillies to their first-ever World Series championship in 1980. Green passed away shortly before the 2017 season. Hoskins was doing great in the Home Run Derby until he reached Kyle Schwarber in the second round. Schwarber hit a whopping 21 shots in his allotted time, edging out the 20 that Hoskins launched out of Nationals Park. He's the epitome of a power hitter, being able to hit home runs on top of the scoreboard, but being a bit, ah, lacking in the defensive department. Let's just say that Kyle Schwarber probably won't be winning any Gold Gloves. When you look at it that way, the question of whether the National League should have a DH becomes an intriguing one. Madison Bumgarner's home runs are quite impressive, and it would be a shame to see that go away. But instead of framing the DH question around "Should pitchers have to hit? ", asking "Should guys like Kyle Schwarber have to play the field?" might give you a different answer. I, for one, was not a huge fan of having Matt Holliday in left field. Back in Fenway Park, we come to 2017's Home Run Derby winner, Aaron Judge. A recipient of the Topps Rookie Cup, not to mention the AL Rookie of the Year, Judge looks like he hit one a long way into the Boston night, as backup Red Sox catcher Sandy León looks on. 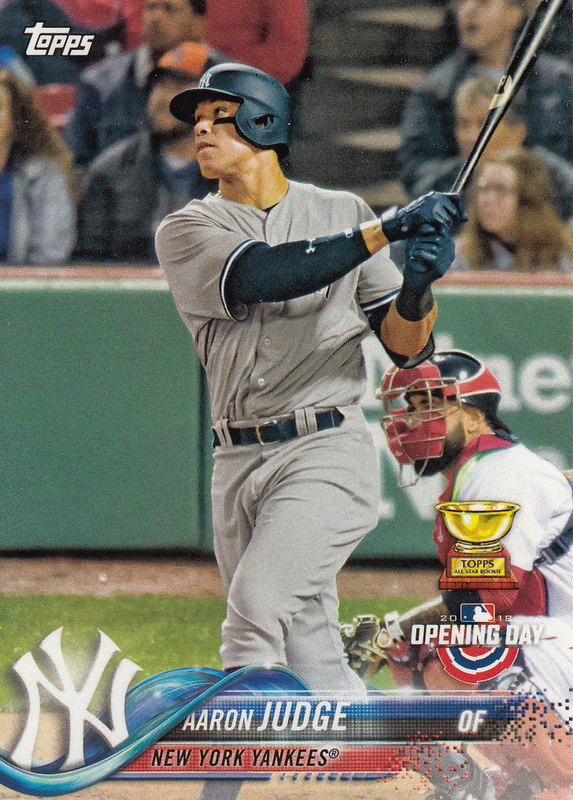 Judge certainly earned that award, as he led the league in Home Runs, walks, and runs scored, the first rookie to lead all three categories, as Topps tells us. 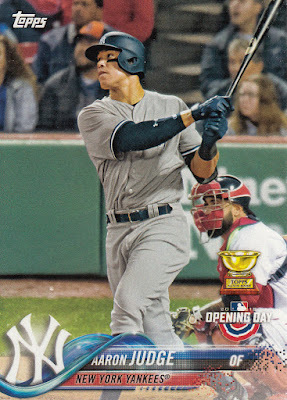 Aaron Judge is sure to have tons of Topps cards in the future, and I'd bet a lot of them will show him inside Fenway Park. Kris Bryant hasn't been in a Home Run Derby in a while, not since 2015. The 2016 NL MVP and man who made the final out of the 2016 World Series absolutely just hit one here, trotting around the bases as an opposing infielder and an umpire stare at where it probably departed Wrigley Field. Bryant looks about as cool as can be with these shades on. He can have fun, too. He, his wife, and Anthony Rizzo just put together a hilarious Newlywed Game-esque skit called "Bae vs. Ballplayer". 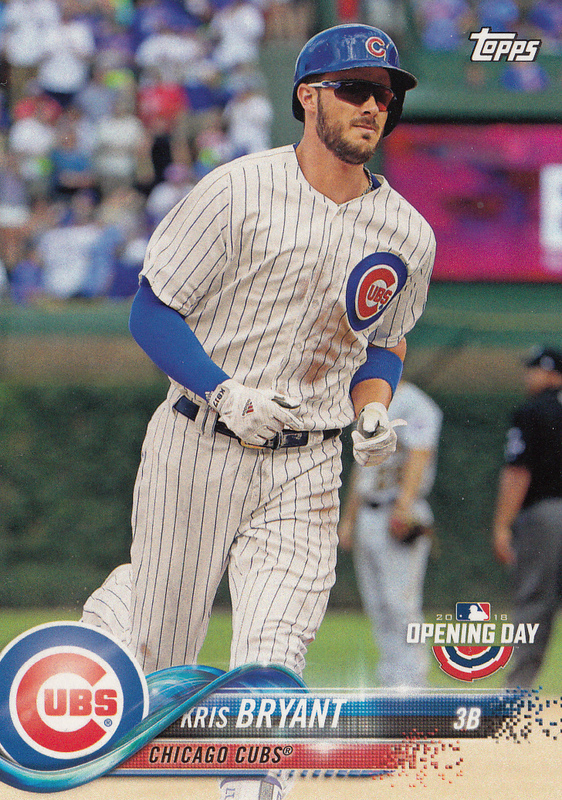 Rizzo knows Bryant's January 4th, 1992 birthday by heart, and that checks out on the card back. I also like pitchers. There's a big outfield banner on this card too, for National Car Rental, but it doesn't pop as much as the red ones. 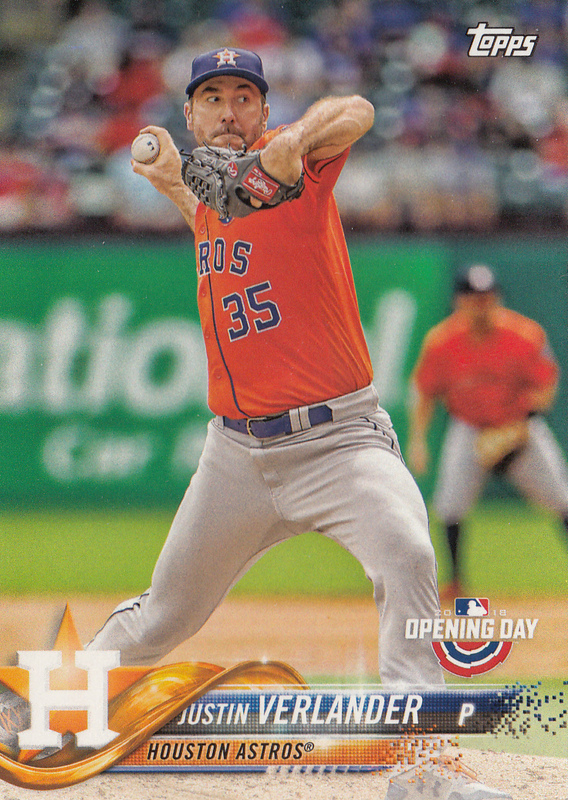 It's my first card of Justin Verlander as an Astro, a late-season trade Houston made that was instrumental in the team winning their first-ever World Series in 2017. I don't usually refer to the "acquired" statistic on the back, but once in a while I'm curious. This trade with the Tigers took place on August 31st, 2017, extremely late in the season, and may have influenced MLBs recent rule changes for 2019. The waiver trade deadline that the Astros and Verlander benefited from will be taken away, putting a hard stop on all trades on July 31st. Not that this will affect JV, but September call-ups are also greatly reduced, as rosters will expand to just 28 players instead of 40. That will make it a lot tougher for prospects to get playing time, but should make pennant races more fair, as potential contenders won't be getting a bunch of free wins against quasi-Triple-A clubs at the end of the season. Corey Seager squared off against Verlander plenty in the 2017 World Series. He hit a home run off of him in Game 2, one of the many games that was more or less a Home Run Derby but with running the bases. 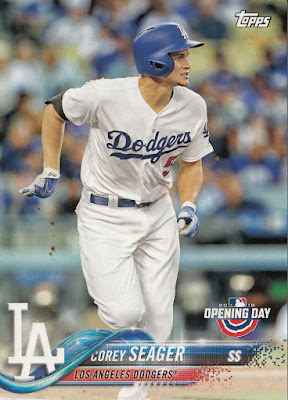 In this card, he's at home in Dodger Stadium, and some of the yellow seats in the first deck are visible behind him. I ran across a good tidbit about those seats recently. The seats are a different color in each deck of the stadium, and they're meant to represent the ocean and the beach. I'm sure all the Dodger bloggers out there knew that, but it was news to me. The card back has a few more fun facts, telling us that Corey's game-winning hit on June 10th, 2017 was his first walk-off RBI at any level. 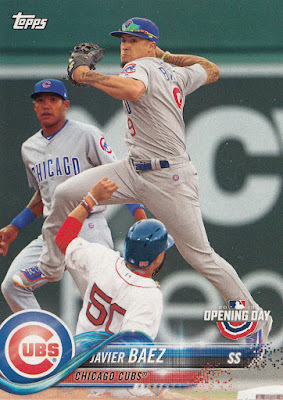 There's a slight error on Topps' part in that they said it happened in the 10th inning, but it was really just the 9th. No matter, walk-off hits are awesome. I saw the basketball equivalent of one earlier this week, in fact. I got tickets to my first NBA game since 2005, and saw the Dallas Mavericks play the Denver Nuggets. It was a close game, probably closer than it should have been, but star Nugget Nikola Jokic hit a buzzer-beater to beat Dallas 100-99. It happened way at the other end of the arena, but watching that shot land was amazingly thrilling. It's just so sudden, and doesn't have the relatively long wait associated with it like a home run or a Hail Mary where we're waiting several seconds for the ball to land. 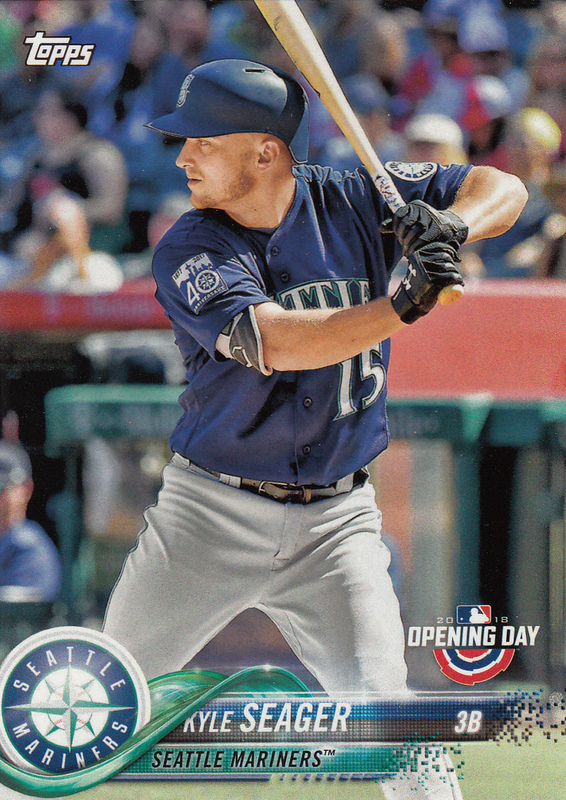 Kyle Seager, Corey's older brother, got a card in 2018 Opening Day, and it has a clear view of the Mariners 40th Anniversary patch. They and the Blue Jays entered the American League in 1977. They're not really that much older than the Rockies and Marlins, who just wrapped up their 25th season. But I was born after '77, making the Mariners seem like ancient history. 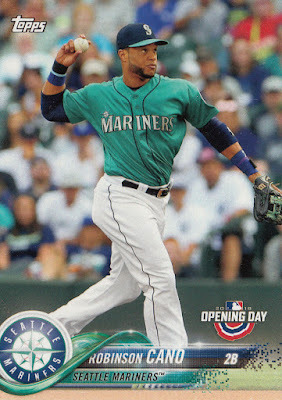 Mariners fans aren't going to have a whole lot to look forward to this year, with Cano and Edwin Diaz shipped off to New York, and Kyle Seager out until around June due to a surgery he just had on his hand. Seattle isn't even letting Felix Hernandez pitch on Opening Day. At least they're scheduled to get a hockey team in the early 2020s. There were one or two Rockies in this blaster, and I picked Raimel Tapia, who had a pretty good card. There's a lot of sameness in the full-bleed photos that just show players in their batting stances, but Tapia isn't wearing a helmet following whatever play just occurred, and there's an unusual view of the foul pole and stadium construction in the background. My first instinct told me this is Miller Park where the waterslide is (how appropriate would that be for this set? ), but I'm not sure that's right. A bit of Googling led me to PNC Park, home of the Pirates, and this large walkway ramp matches a few of the many Pirates cards I found in 2017's Opening Day blaster. That would date this photo to either June 12th or June 14th, 2017, the only games Tapia played in during the Rockies' visit to Pittsburgh that year. Up until now, I've only shown vertical cards. I wouldn't say there was a shortage of them in this blaster, just none that really caught my eye. 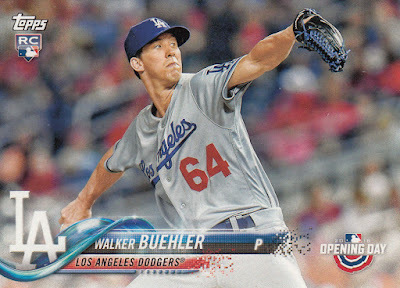 And I think Walker Buehler, who finished third in NL Rookie of the Year voting, is going to be one to watch. That is, assuming he can stay healthy. 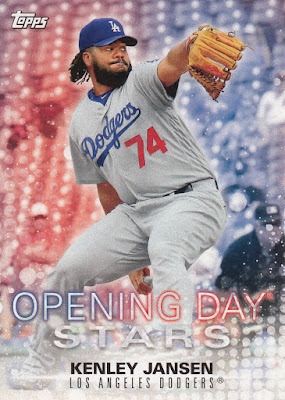 This card points out that the Dodgers drafted him knowing he would need Tommy John surgery, and they're handling him delicately this Spring Training. Also on the card back is his twitter handle @buehlersdayoff. There are still the inserts to cover, always a great part of Opening Day. The actual Opening Day for the 2019 season is not far off. Officially, it's March 28th, the earliest ever, but the Mariners and Athletics are playing two games in Japan on the 20th and 21st, which will technically count as regular-season games. I hope that my annual Opening Day blaster isn't far behind. Like Infield Fly Rule? Try these. Puzzle: Why are Yamakatsu cards always minty while Calbee ones are always destroyed?